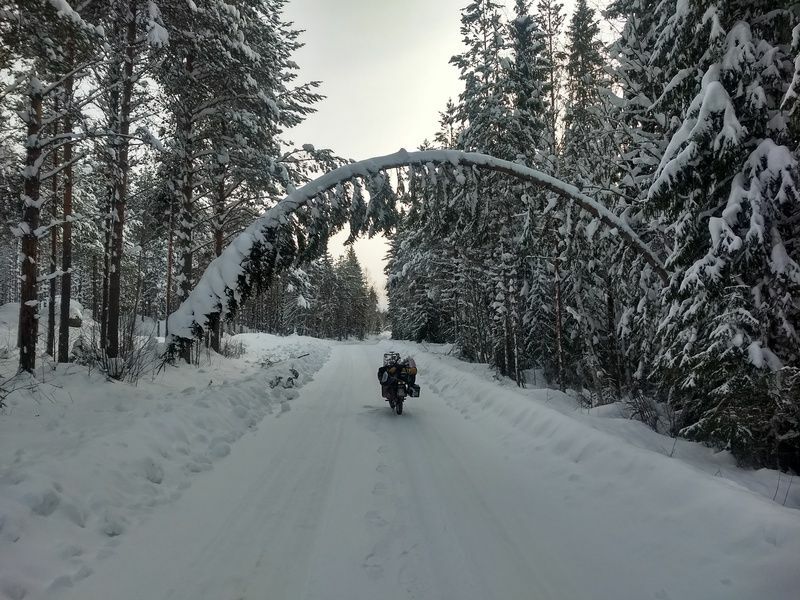 Discussion in 'Ride Reports - Epic Rides' started by sarcus, Dec 25, 2018. What a great log of an unimaginable trip for most of us. 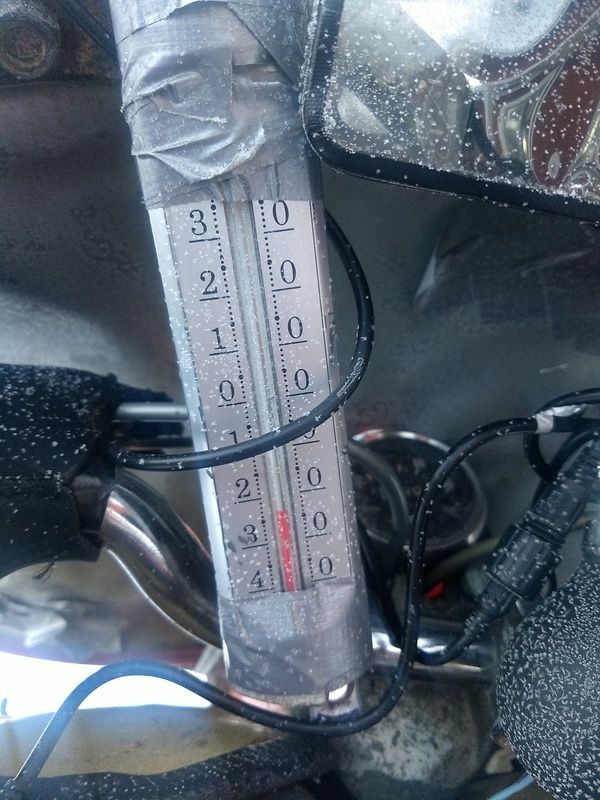 You certainly peg the risk management meter the entire way. Some trips are hazardous only in mountainous regions or rivers or swamps...because of the extereme cold, you faced danger the entire time! 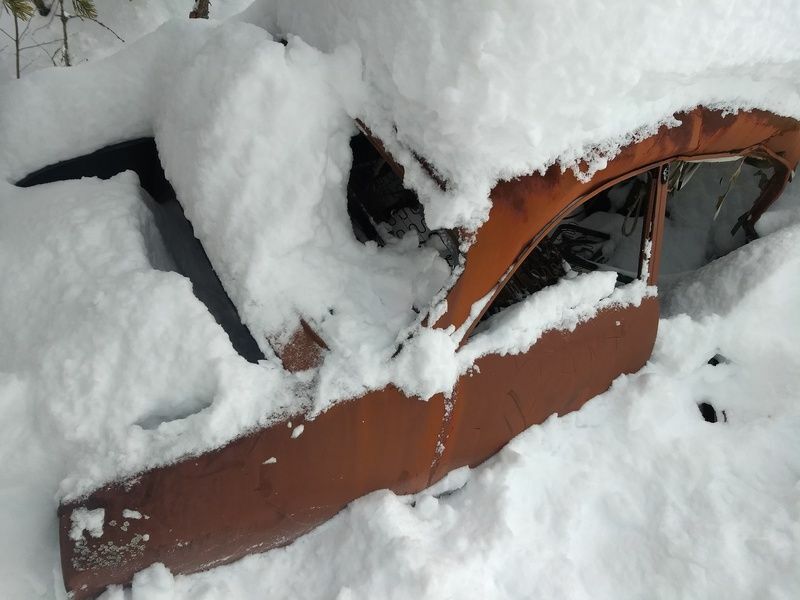 Perhaps you could address how you managed your phone, GPS and any other electronic equipment in the cold. Some phones are stated to not work below -10C by manufacturers. Did you have an on-board charger for them? I don't think you mentioned the manufacturer of your insulated suit that kept you alive all this time. Is there any gear that you are going to buy that you think will do a better job than what you had?Congrats on a job well done. Your perseverance and determination are monumental. Hats off!! itlives, sarcus, btrrtlwtr and 1 other person like this. 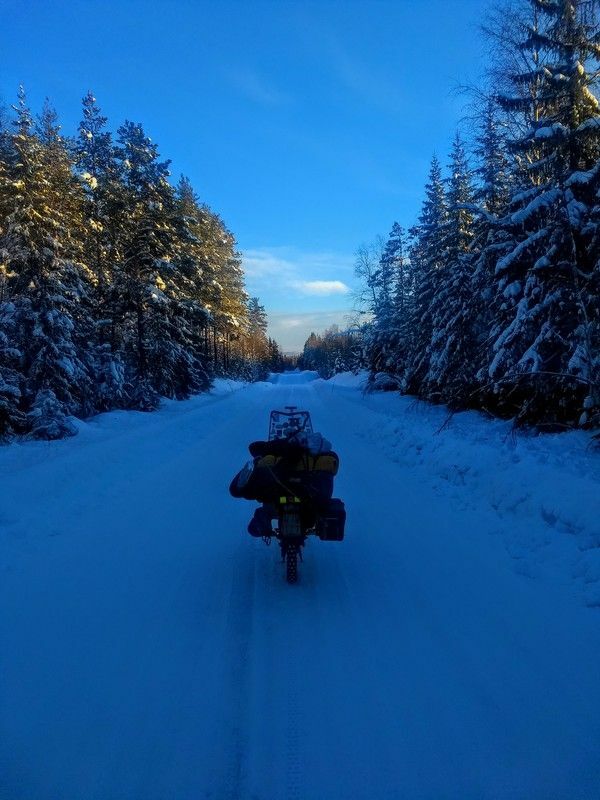 Awesome ride report. You are one brave man. My hat goes off to you. 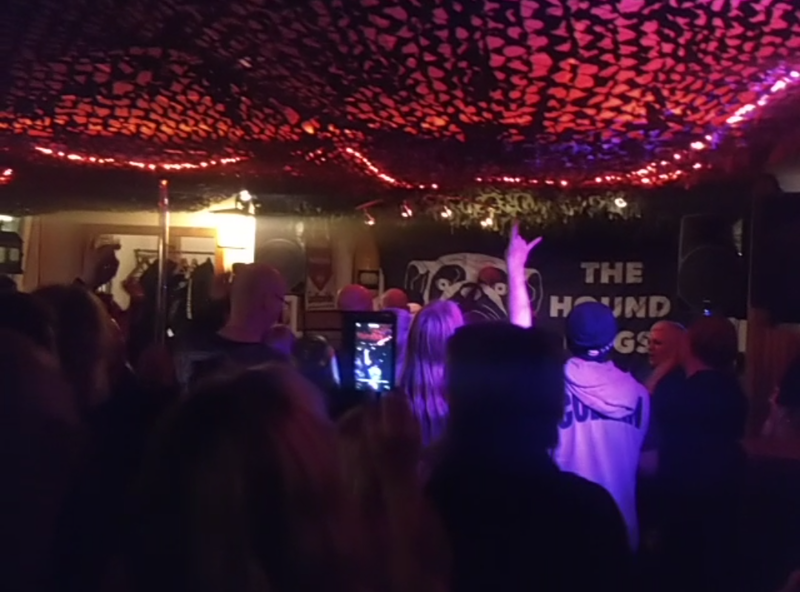 The day I arrived at the clubhouse from the Blacksmiths motorcycle club they told me there would be a party on Saturday with a live band. So I decided to stay a couple of days. In the following hours I met a couple of members. They told me about there projects and showed them. As a not so big chopper fan I must admit they owned really nice rides. Going from oldschool to the more new stuff. Mainly Harley but they also used triumph and BSA engines. That the most of the members were born with two right hands and had a feeling for shaping things came clear if you looked more and more to the details of the clubhouse. Since there existence this old blacksmith building is built up with many self built and self invented stuff. 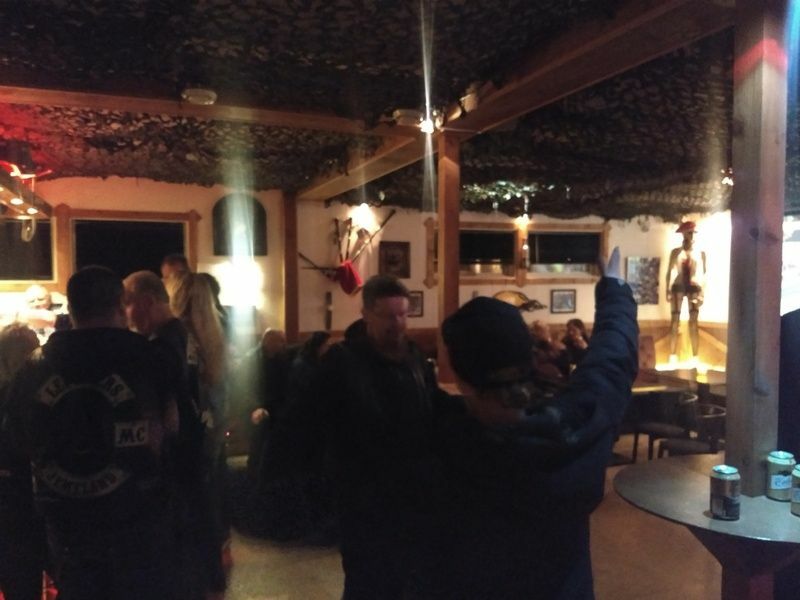 I discovered that this clubhouse wasn't the only cool mc clubhouse from the Skelleftea region while doing a guided tour with one of the founding members "Pudde" . Apperently the're up to eight mc clubs in the neighbourhood. While I thought the party, organised by an other mc club Loud Pipes, was on saturday a member Filip invited me to go to the pré-party. Can't say no to that! 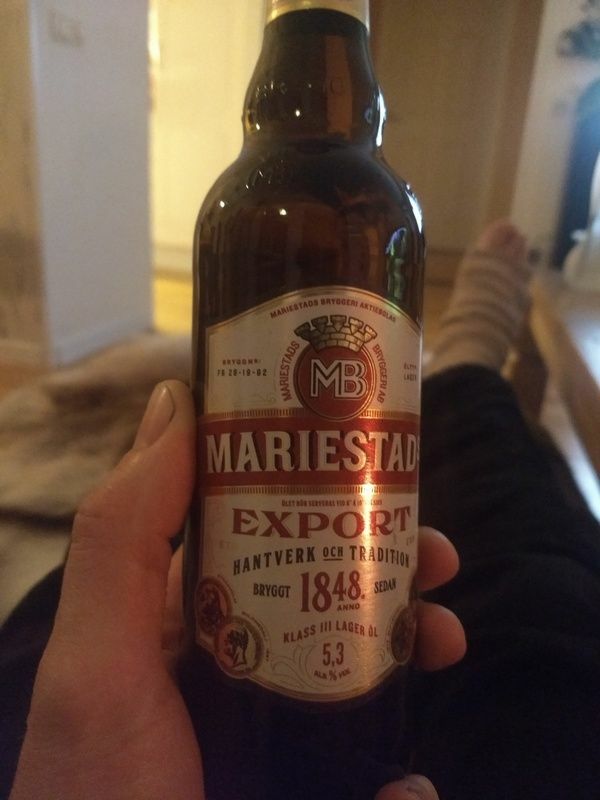 While drinking lots of beer I talked to a lot of people, telling about my journey and mostly got the answer I was crazy. Most of the later part of the night was a blur and when I arrived back at the club I emptied my stomach. 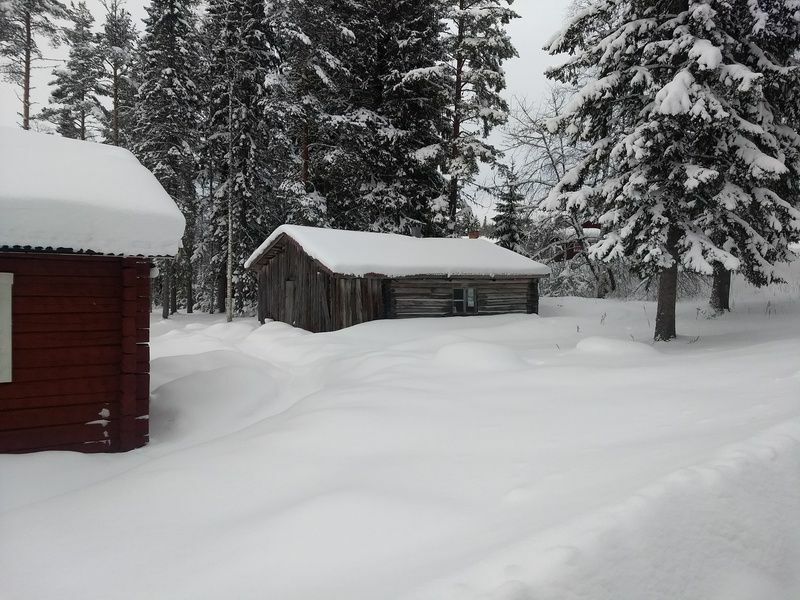 Luckily snow covers it all, bij it looks like I exaggerated with the beers. Saturday wasn't easy to wake up but when you have a good breakfast it's more easy. Before we attended the party a lot of members came to the club to dinner together. 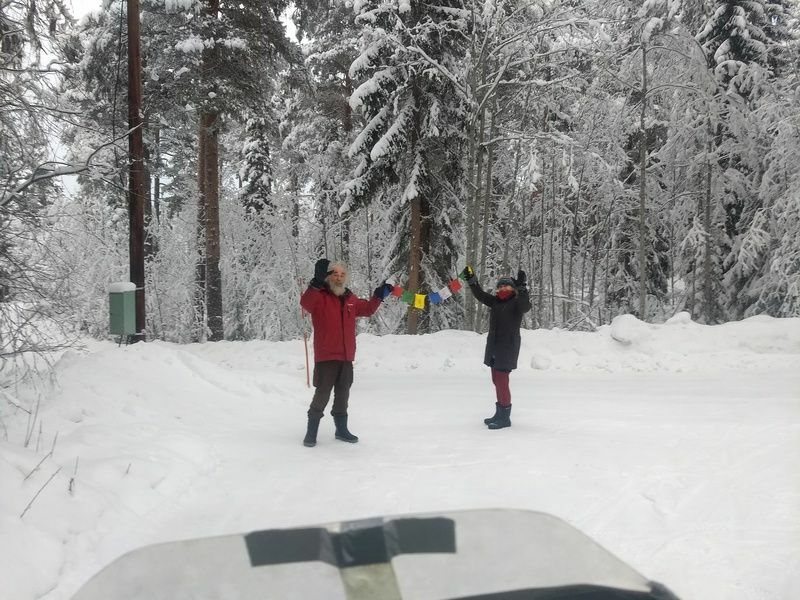 While others were making chili con carne with moose meat, I got to know more members. Great guys to talk with and all with the same passion for motorcycles. At the party "the hound dogs" played for a room of enthousiastic people. There even was a moment for karaoke. Again I had a lot of conversations and compliments about the trip. Waking up on sunday somewhere after 12 I decided to continue on monday. After two days of partying it was better to rest. 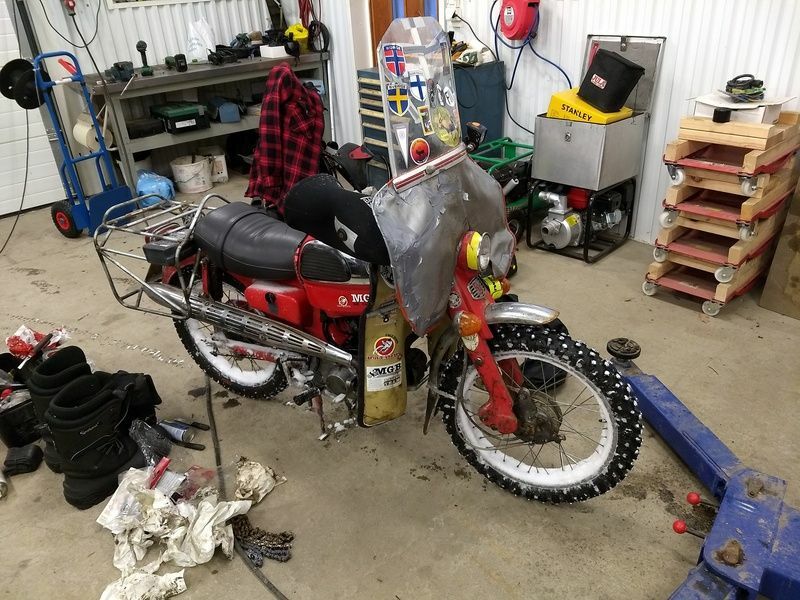 So I only got the bike ready for the day after and checked the oil. 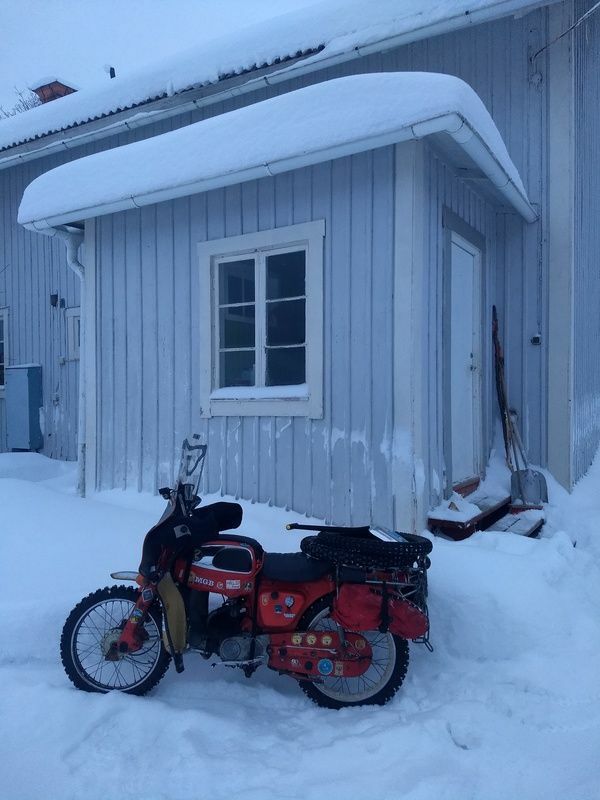 On monday I left Klutmark and headed to Umea where I could stay in the house of a motorcyclist called Anders. In Bursträsk after about 25km I lost the front in a righthand turn hurting my rightfoot. 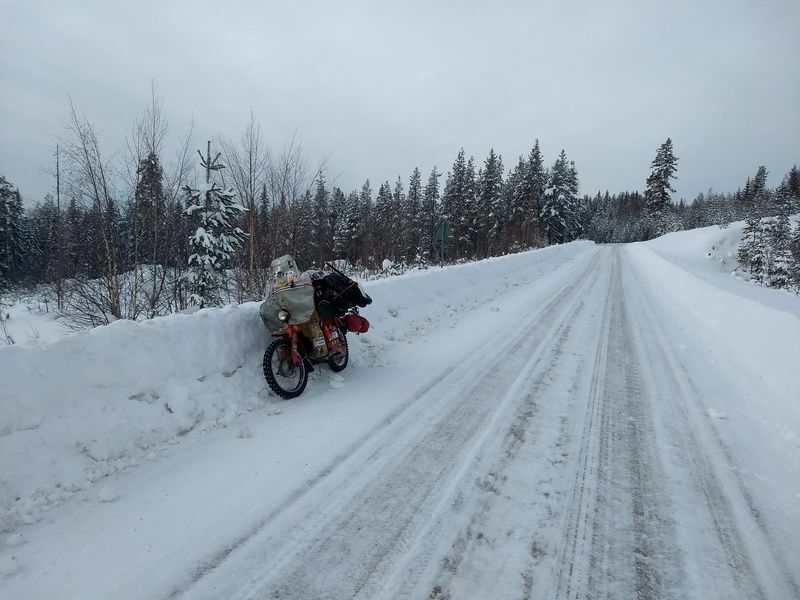 A Russian lady stopped to check on me , helped getting the bike back up and asked if she should call an ambulance. I was walking like a pinguïn but I refused the offer. 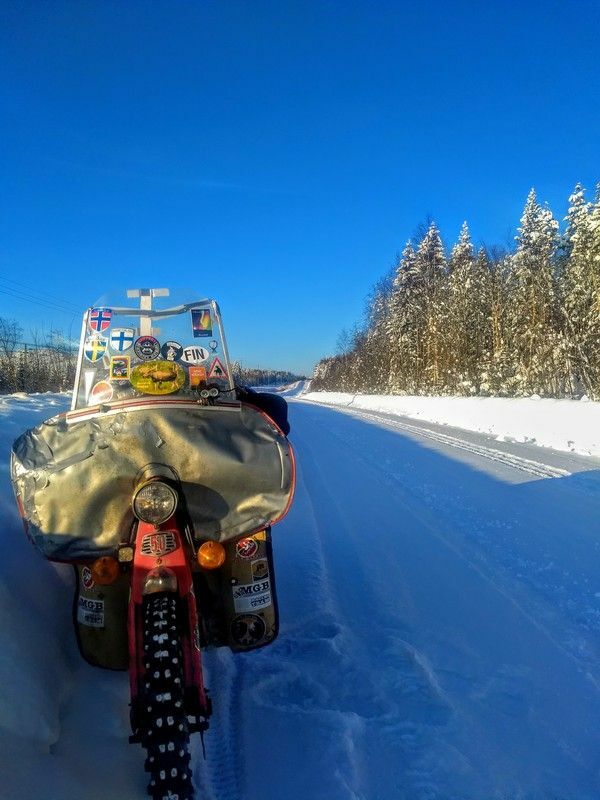 I rather did the last 100km to Umea. I grabbed a piece of the windscreen , kickstarted the bike while doing some inside-helmet-pain-yelling and took off. Not very much further I stopped for a coffee. On this trip people give you a certain look when they see me coming with the old Honda. Now they looked even more when I came stumbling inside. 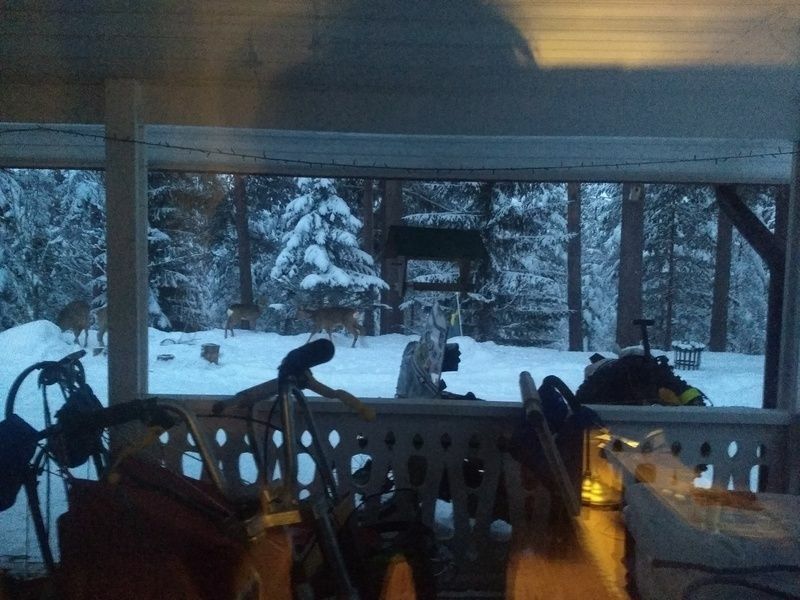 When I finaly arrived in Umea I had to wait a couple of hours until Anders was home. 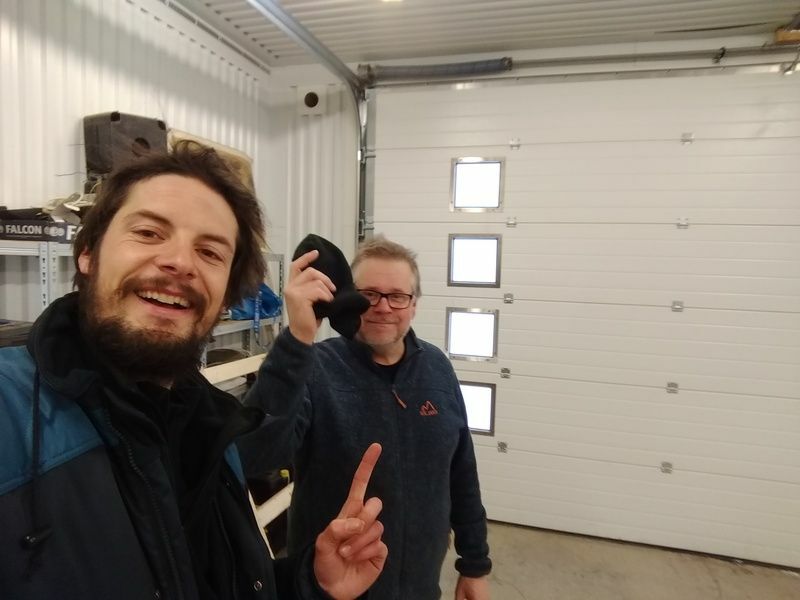 My right foot still hurt so when I put the bike inside the garage Anders brought me to the "emergency". I was there for ten hours. Worse than Africa. At one point I even though some nurses got there diploma with an ABBA record. 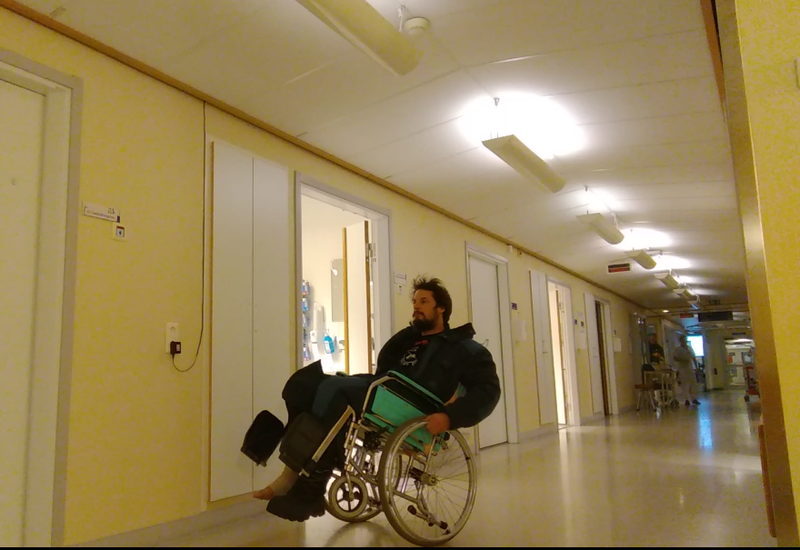 I do not want to bore you to much with the details but 4h30m after the x-ray at 4am a doctor came to tell me she didn't see anything but she wasn't a radiologist so they would call me during the day. If I wasn't so tired I would just...... After waking up I had to call them instead to hear the only words I wanted to hear: no cracked lugaments, no plaster. I have no words for this kind of "emergency" service. 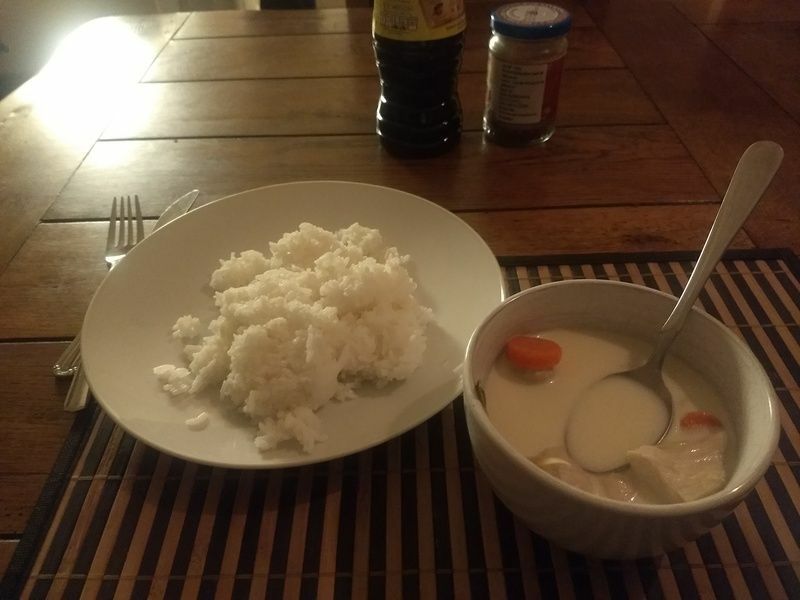 Luckily Anders was a very nice Guy and I made me a little dinner-breakfast : breakdinner? just before I went to bed at 5.30am. Yesterday evening I got to know Anders. 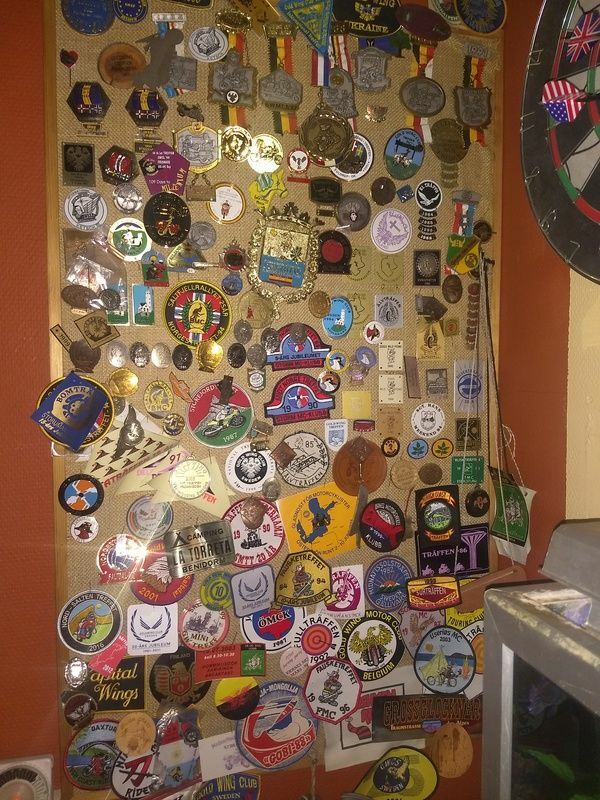 The guy has an impressive collection of mc-meeting badges since the early 80's. 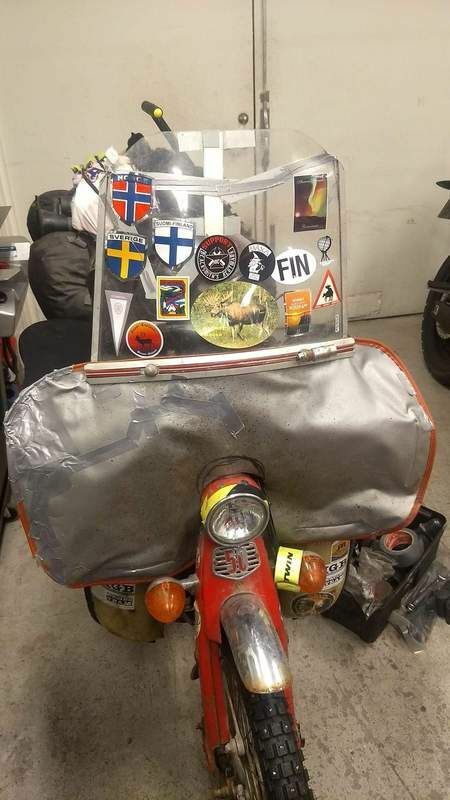 Claiming he rode more than 650.000km on several gold Wings during the years, I believe this man. He had also a lot of great stories and pictures. Today I'm still at Ander' place and didn't cover a mile because of the right foot. 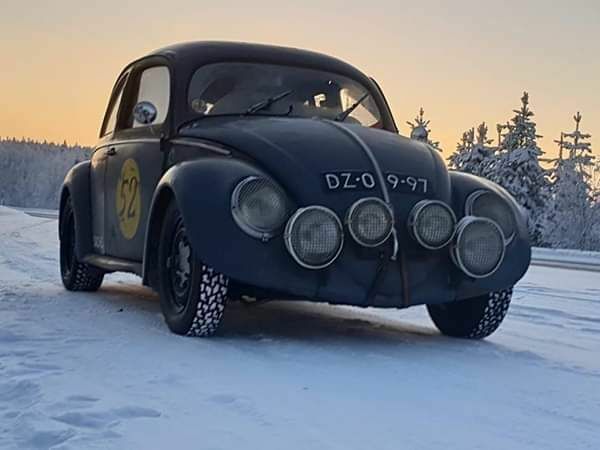 I hope to continue tomorrow and hopefully I can watch the ice race event for old volkswagens in Rissna, near Östersund this weekend! 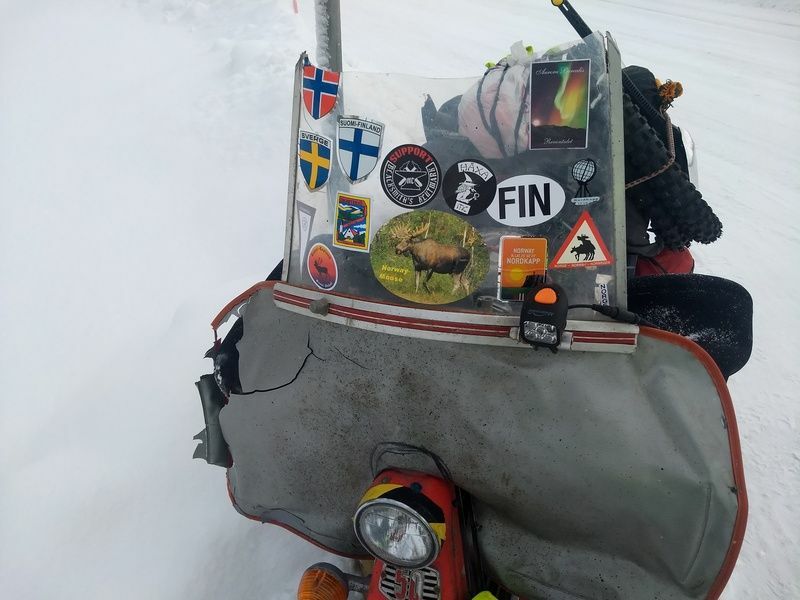 Also congrats to these guys for almost reaching Nordkapp. 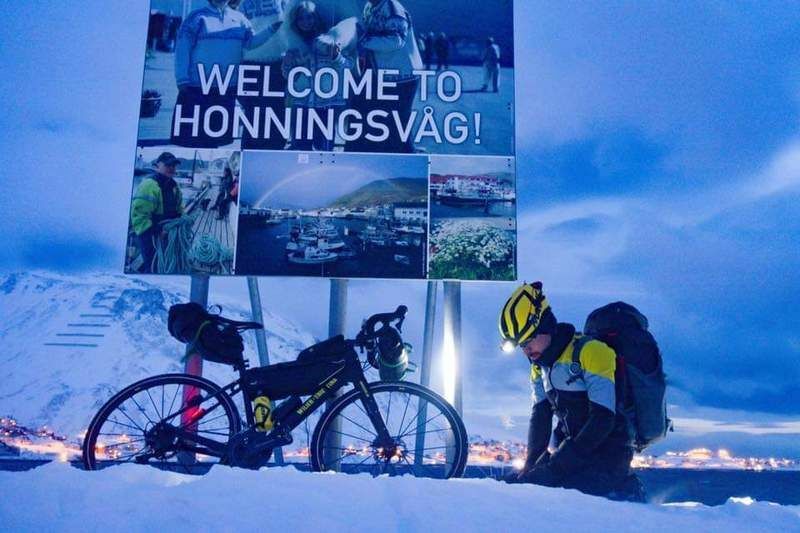 Both are in Honningsvag. boboneleg, Uke, Knobbly Studios and 19 others like this. 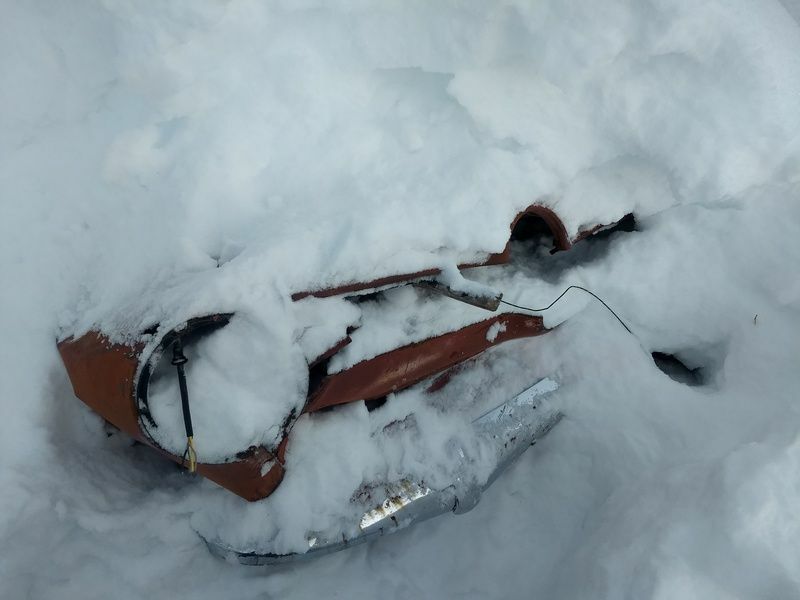 Perhaps you could address how you managed your phone, GPS and any other electronic equipment in the cold. Some phones are stated to not work below -10C by manufacturers. Did you have an on-board charger for them? I don't think you mentioned the manufacturer of your insulated suit that kept you alive all this time. Is there any gear that you are going to buy that you think will do a better job than what you had?Congrats on a job well done. Your perseverance and determination are monumental. Hats off!! Navigation: Archos smartphone. 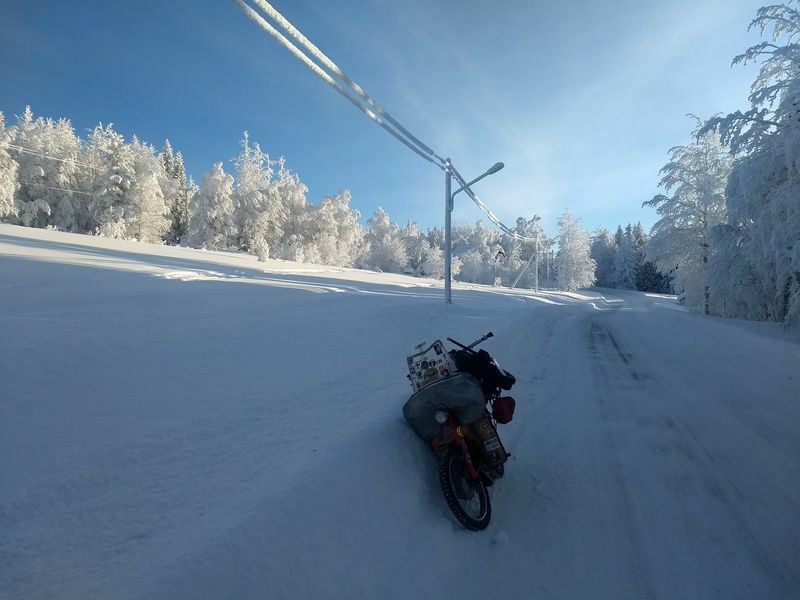 Functioned very well in minus 28. But it needs to be charged. Because the battery goes empty fast. In my case: powerbank or the 5v USB output from my engine. 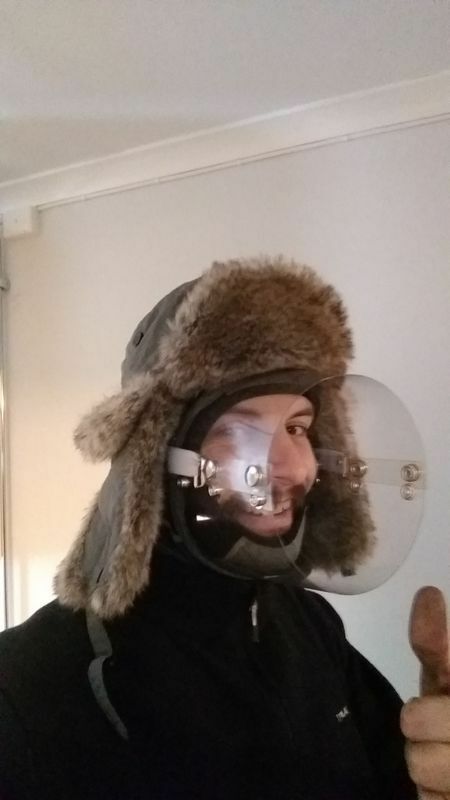 This one I only use for navigation. I have an other one , Motorola, that stays inside my suit while driving. In the cold it can do very strange things. 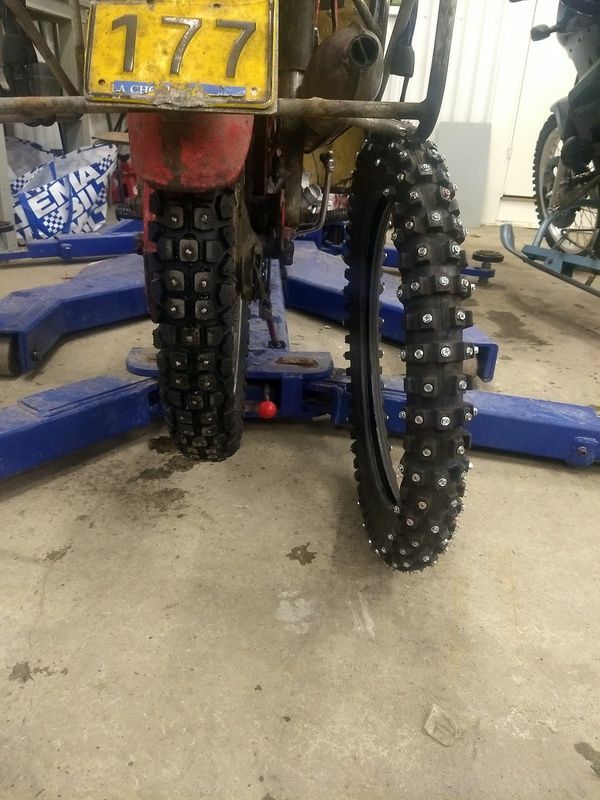 Concerning the bike: next time I know what to change .I need more clearance for better tires and larger spikes. 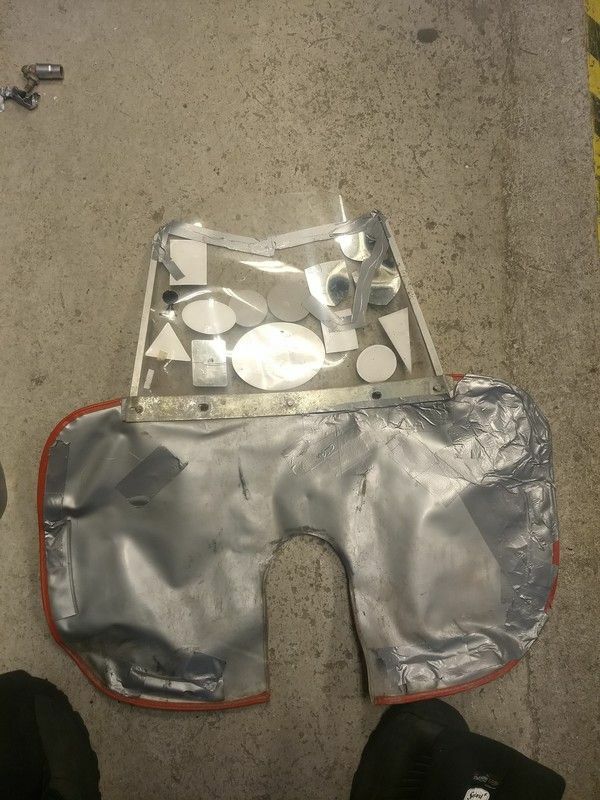 And I also have to weld a frame for the legshield , so it's crashproof. Now it's a bit weak. Uke, squadraquota, norseXL and 3 others like this. You deserve massive sponsorship dividends for that suit and also the "hot hands" product! CROSSBOLT and sarcus like this. Uke, CROSSBOLT and sarcus like this. 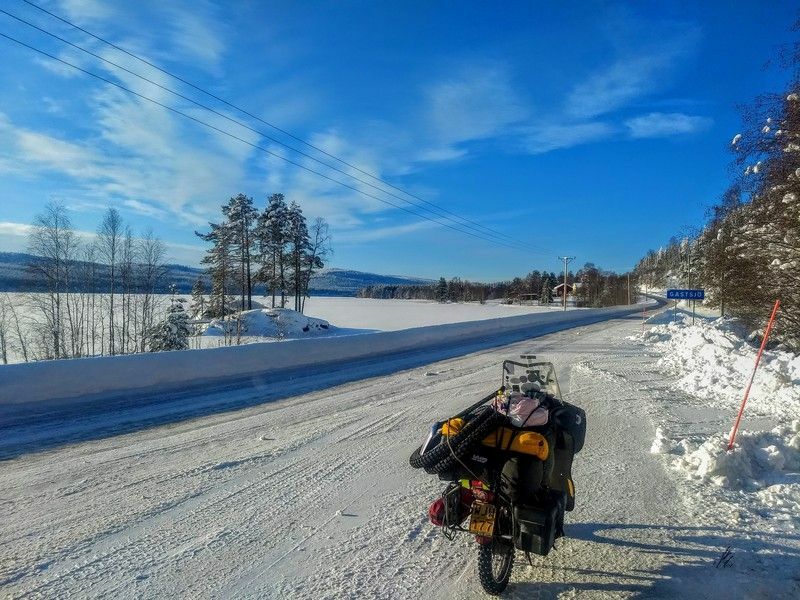 wishes you the best of luck for the future and in coming trips or journeys with your s 90 honda ,been a joy to sit here reading and watcing your photos ,a great rewiev of this epic nordkapp journey of Yours. 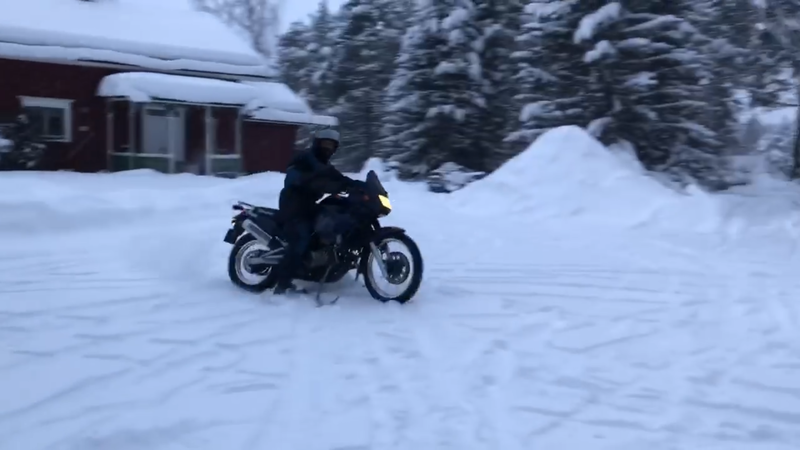 After a pleasant evening drinking beer and watching GoPro movies from Anders' trip to India where he rode a Royal Enfield himalayan and a bullet for three weeks, I left Umea. The ankle wasn't healed yet and the silly walk was still there. 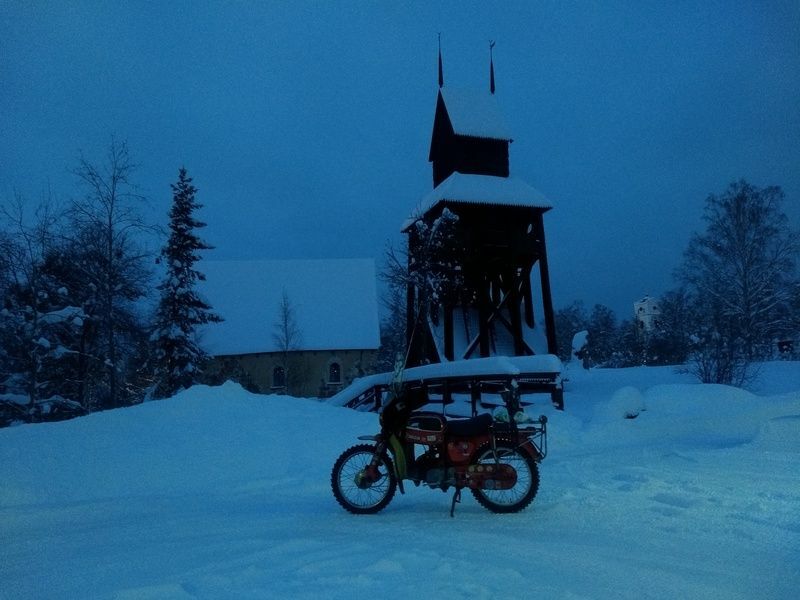 I loaded the .gpx file and it said 241km to the destination, Backe. I was sure I could do this in one ride. It were going to be mainly bigger roads so the average speed would be around 45/50 km/h. Everything went well and I ate kilometer by kilometer. 20km before Asele I took a shortcut. Lot's of climbs in combination with white covered roads. 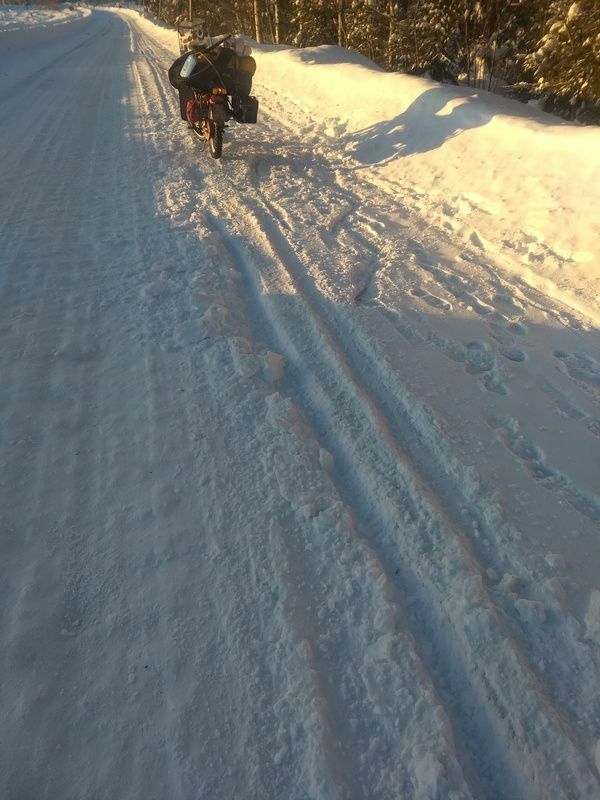 At 11am and 113km before Backe the chain broke. 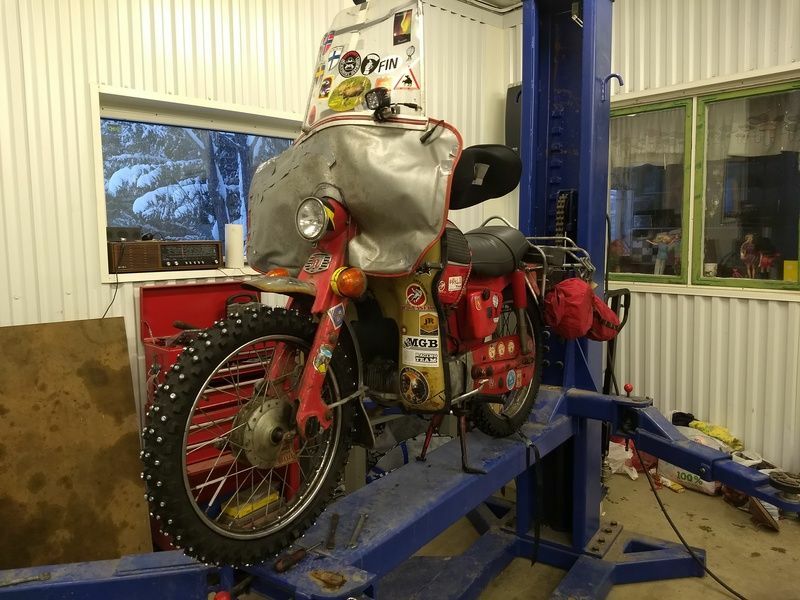 While discovering the problem I remembered Lars-åke asking me if I shouldn't have bought a spare chain,in the biltema back in Luleå, and had a laugh. 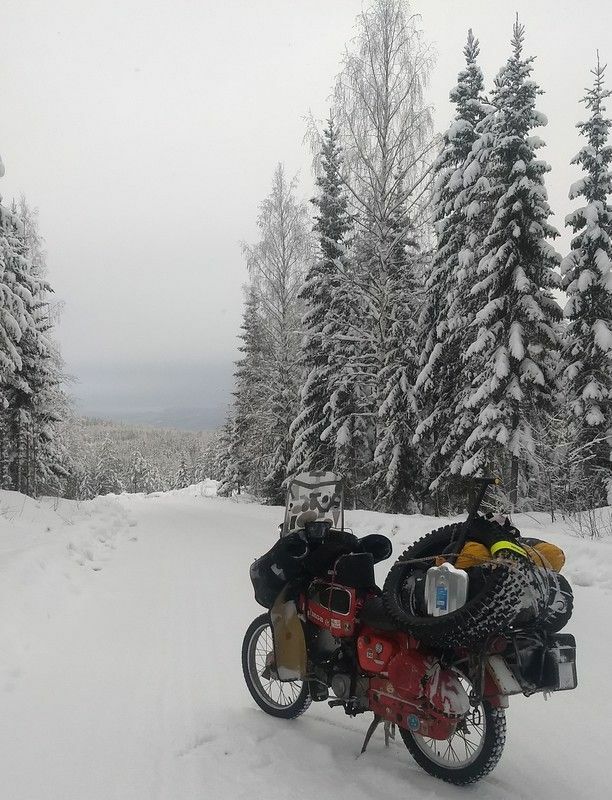 It was -15°C and I was in the middle of nowhere. When I took the toolbox from the rack a 4x4 stopped and an older man asked me what the problem was. I answered that it was not a big problem because I had a spare chainlock ( name?). I went through the toolbox and found nothing. It must be at home than. The man was still there in his car in the middle of the road and said he maybe knew somebody that had something. Meanwhile I found a piece of a chain in the box. The guy now had called two friends without succes. He had problems leaving me alone in the cold but I told him I would fix it somehow. 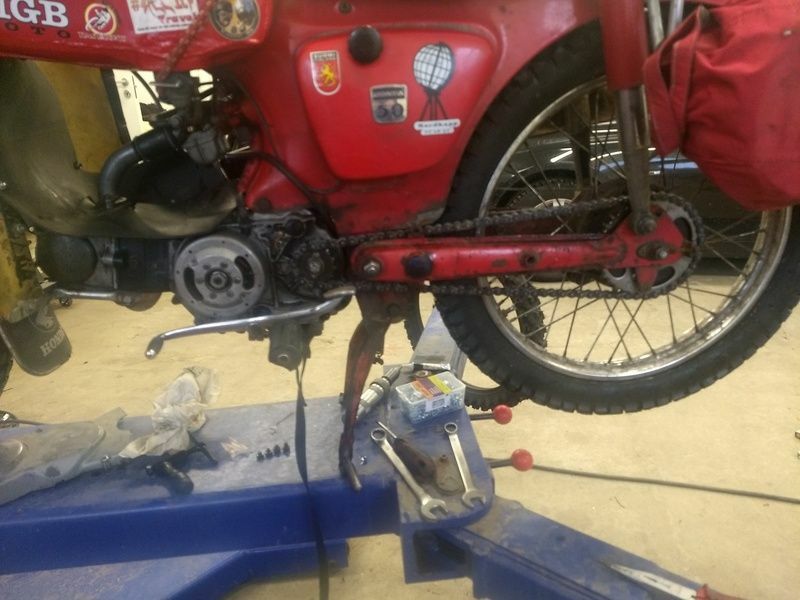 Using a chainbreaker, a big wrench to use as a hammer, a 10mm washer and a universal plier I got the chain back together. "Fingers crossed" while riding I went further after one hour. Still following the GPS I kept going on the small roads. 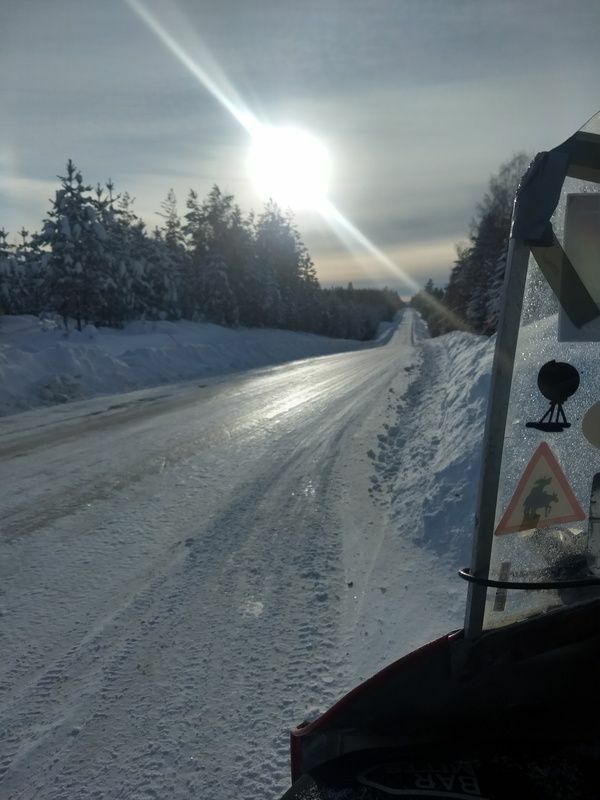 Around 85km before Backe I had to turn left but the road was covered with at least 50cm of snow. The other road ended 2km further. There was no other options than returning to the big road I crossed some time ago and to ride to Asele. 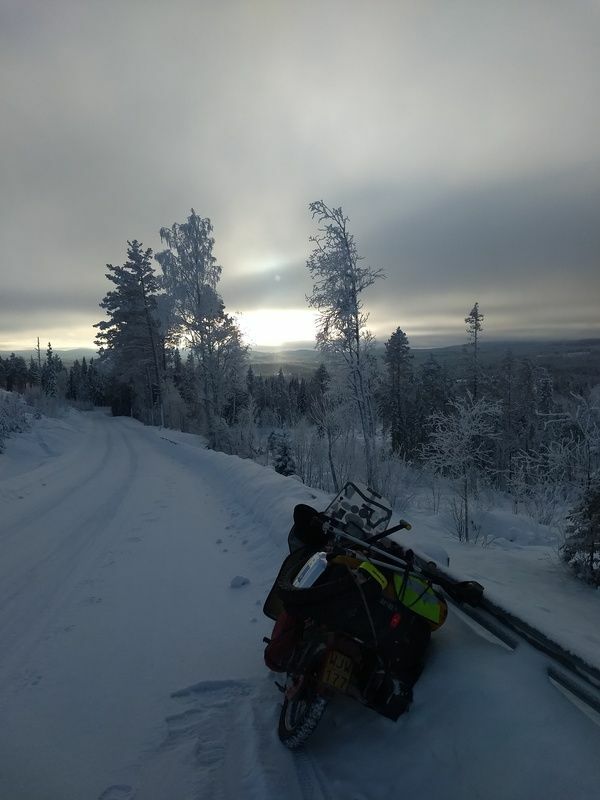 After a while I was back on track to do the last 70km. 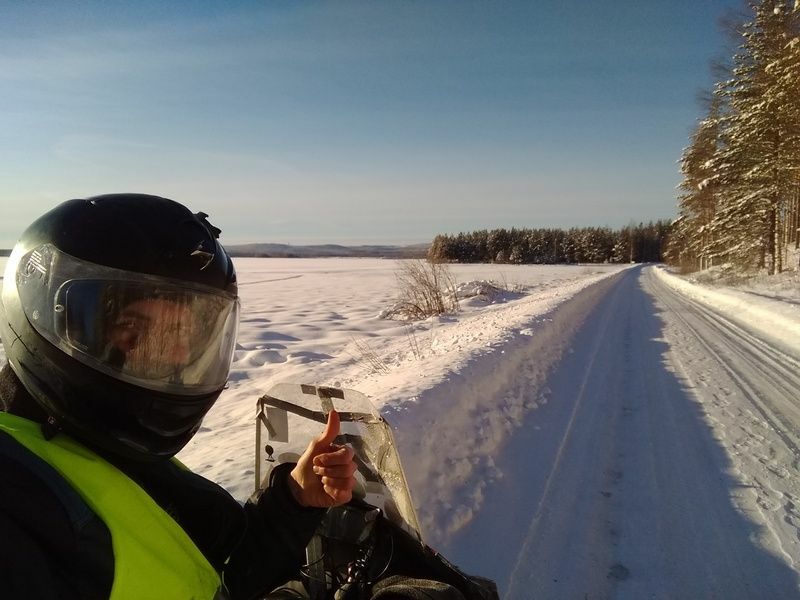 I had been riding the whole day with open visor and I was hoping I could reach Backe as soon as possible. 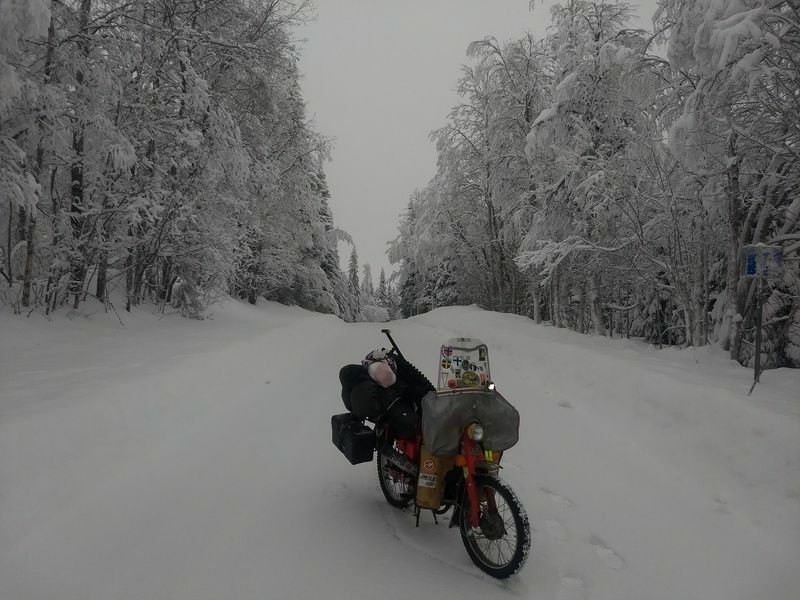 All the way in my zone, frozen, completing 278km, I arrived at John and Riet their place. 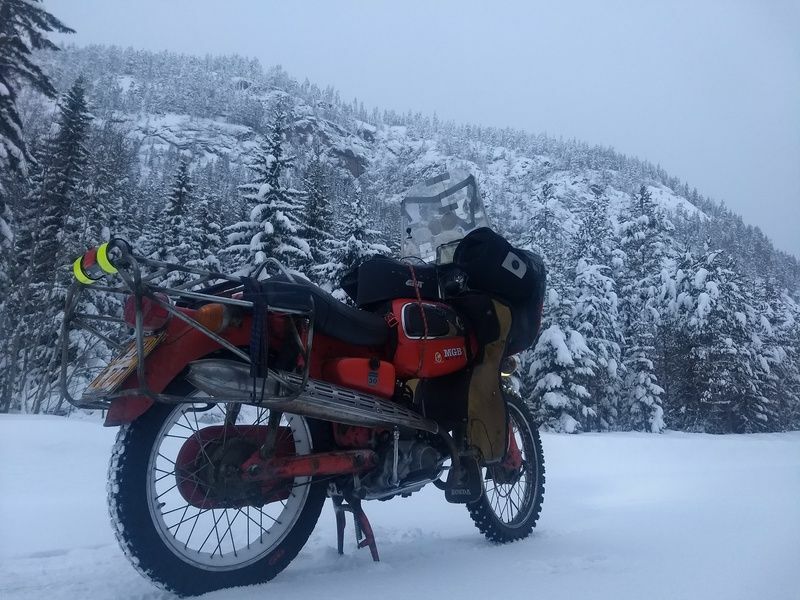 It looks like I didn't learn anything from previous long trips below -15. I guess I like to suffer. 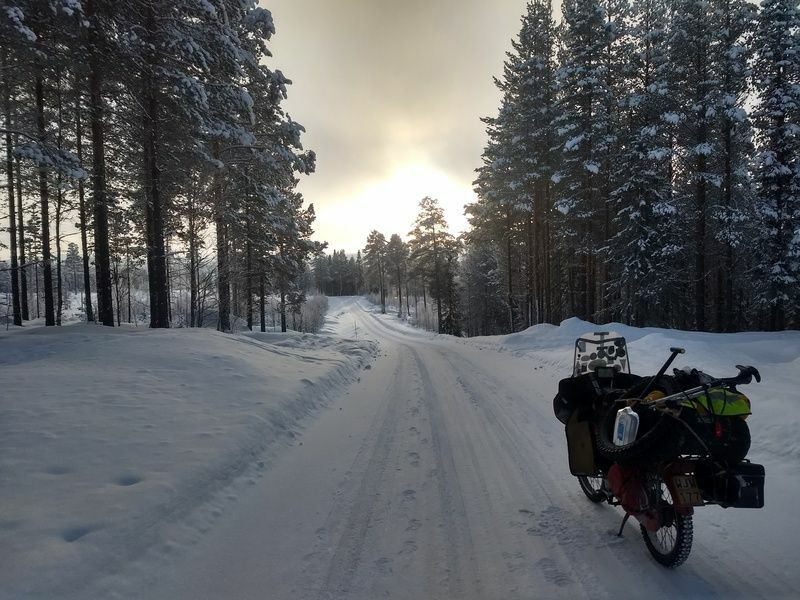 When they welcomed me for the second time this journey they saw that my crutches were fallen off and were dragging along the snow. I never had a clue, but was happy I didn't had to go any further. Riet saw I was thirsty and a kind of hungry and needed to be in higher temperatures. While drinking some kind of bubbles, to celebrate my achievement, I told a couple more stories I gathered along the way. Riet had made ' Gentse waterzooi' for dinner and it tasted very good. This was the food I needed to recover from today's trip. The pleasant evening went further and after a dessert and a good cup of coffee I was ready for my bed. It was only after 8pm but this day took a lot of energy and my foot needed a good night of rest. On friday morning I got the biggest breakfast to take care of. But it gave me a lot of energy, and that's what you need when driving in the cold. Actually it felt like summer with only around -10 degrees. This time I checked if everything was with me because last time I forgot a few things. 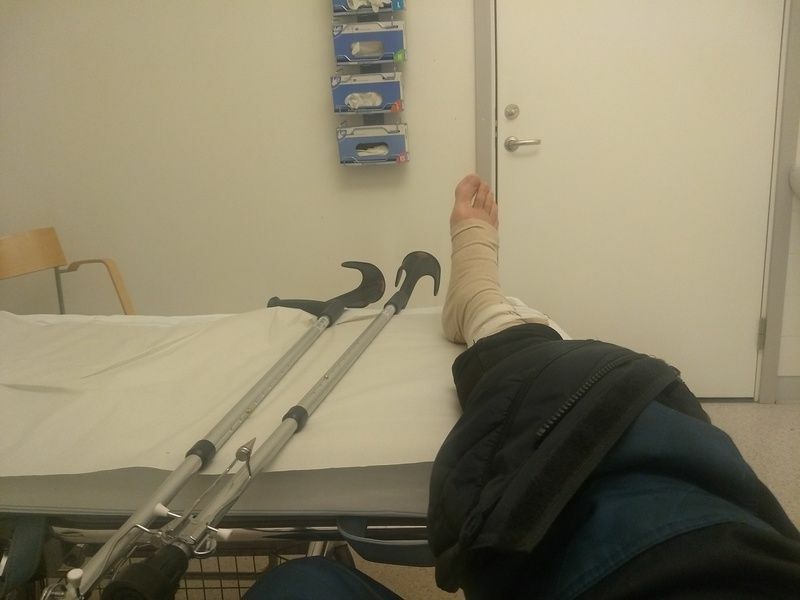 The crutches I didn't take and will see me again somewhere after the winter. We said goodbye and I went direction Hammarstrand where I was welcome again to Sören and Gun. It was a relaxing day , only 110km so I didn't had to Rush. Once I passed Ramsele I took a smaller road that was a lot shorter in distance. 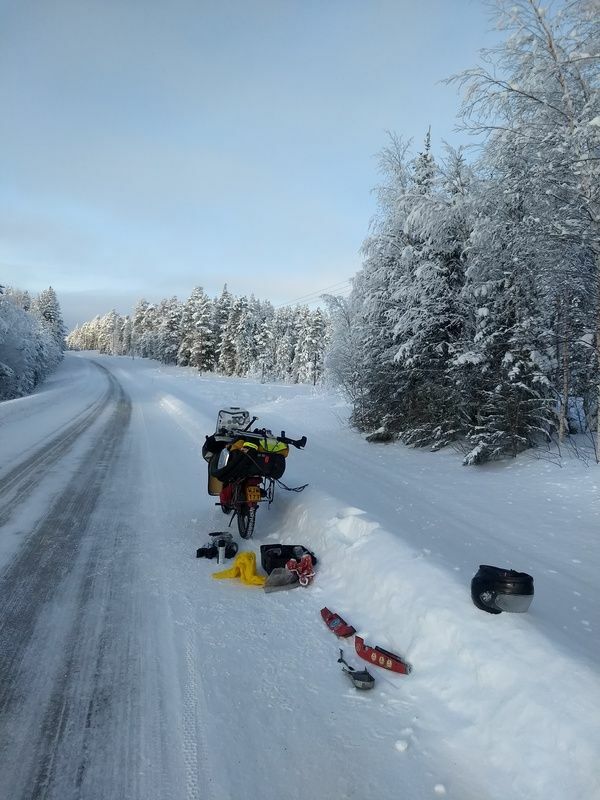 On the road was at least 10cm snow and that made this last 50km not easy. But the fun thing about this lonely roads was that I didn't came across other traffic. The last 40km hadn't seen traffic at all, it was like riding a blank sheet. I really enjoyed this road and the chain that could break didn't even came to my mind. In case of a breakdown then you never walk alone , they say. 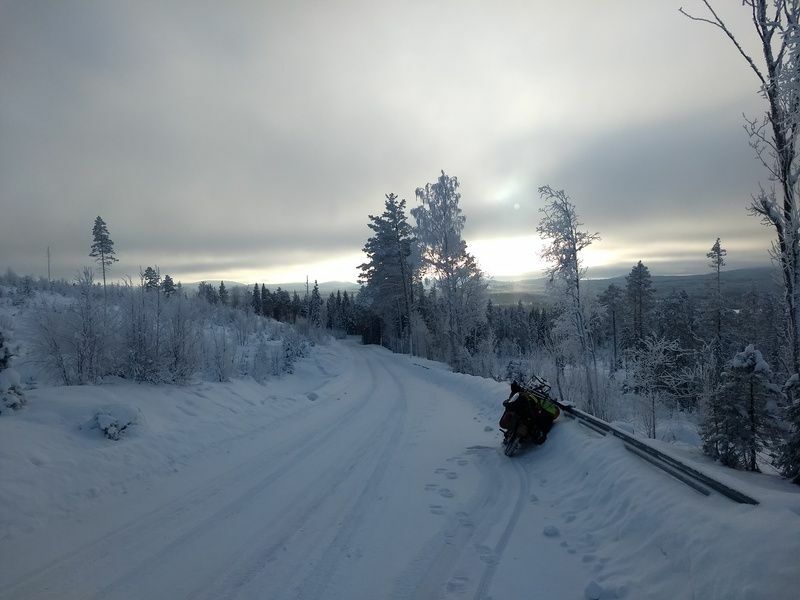 Around 1pm I arrived at Sörens place and while drinking coffee we talked about the Nordkapp adventure. 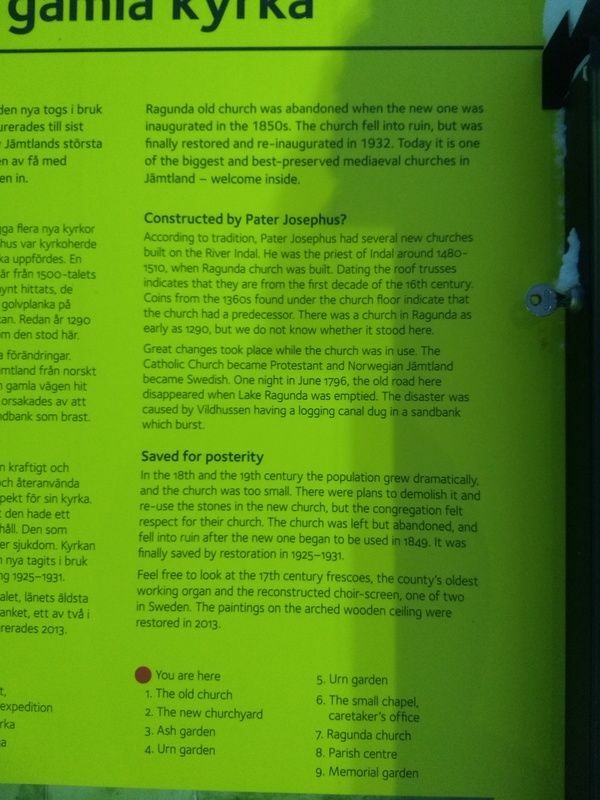 Lucky once again: he mentioned he had to pick up his son in Sundsvall. And there were a lot of big shops including a Biltema. 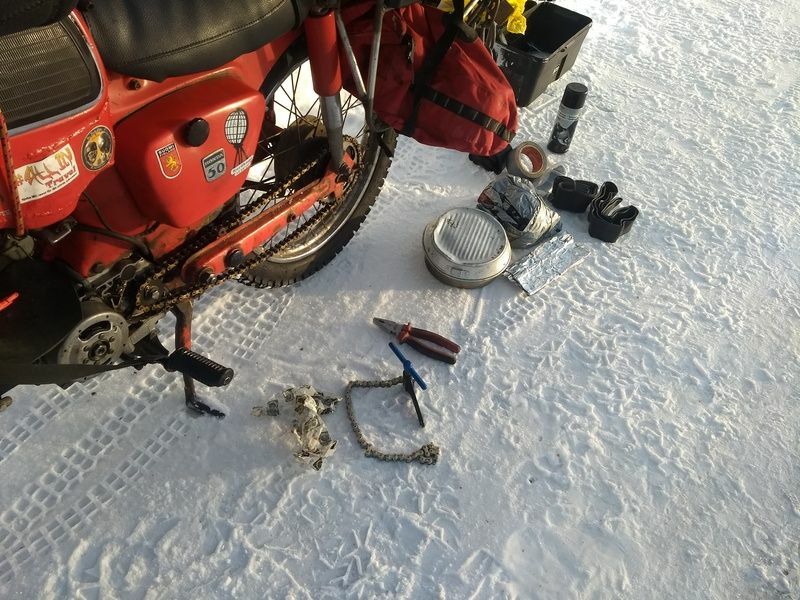 Perfect time to buy a new chain and some other parts like a rubber pushhorn. This you can't pinch in such a cold weather and that I discovered the day after. After we got back I could join dinner and after a couple of beers I called it a day. 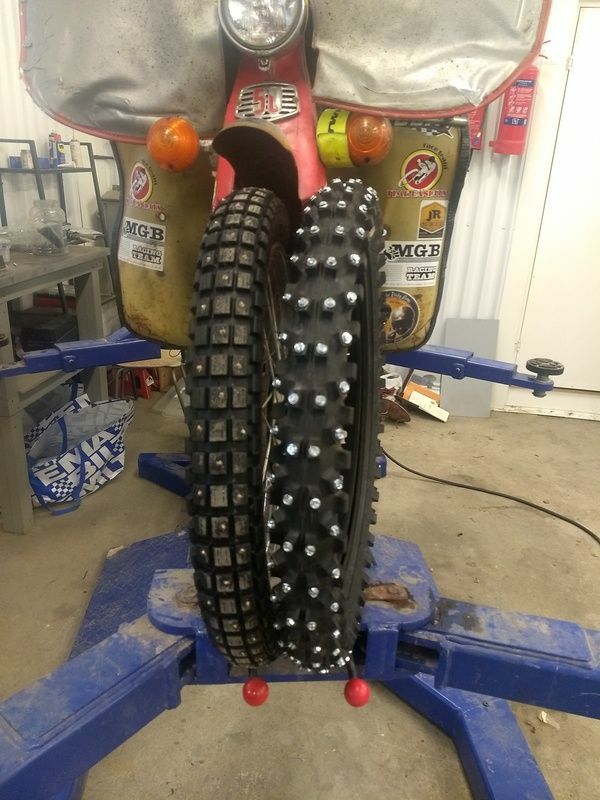 On Saturday I changed the chain and decided to change the fronttire. 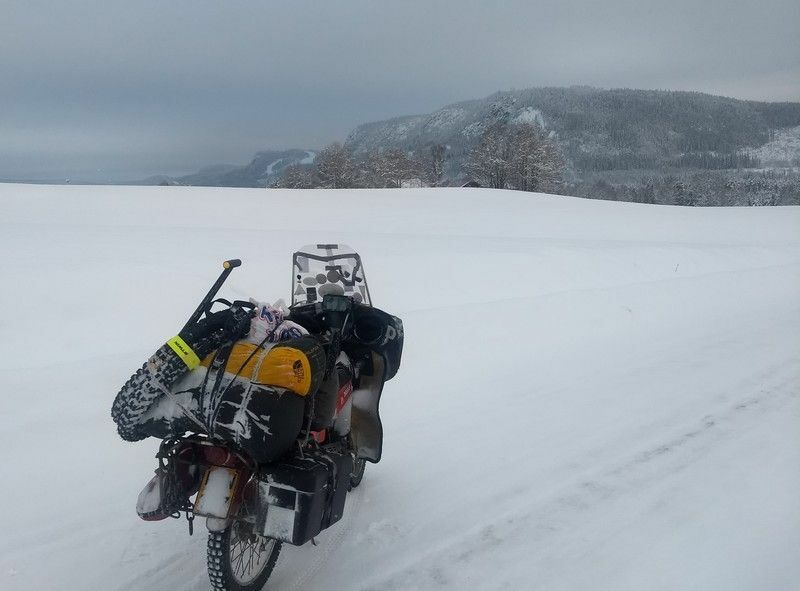 I was carrying these crosstires for almost 4000km now , still thinking about using them and if I wanted to test them this was the moment. 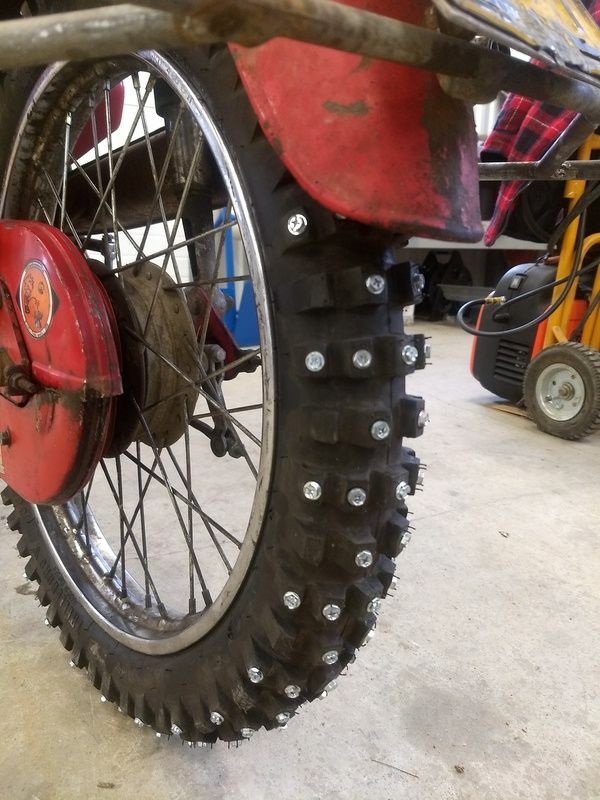 I took the tire, 250 little screws, a little tube of loctite and started putting them in every knob. After getting the tire on the rim we tested it. Looks good! 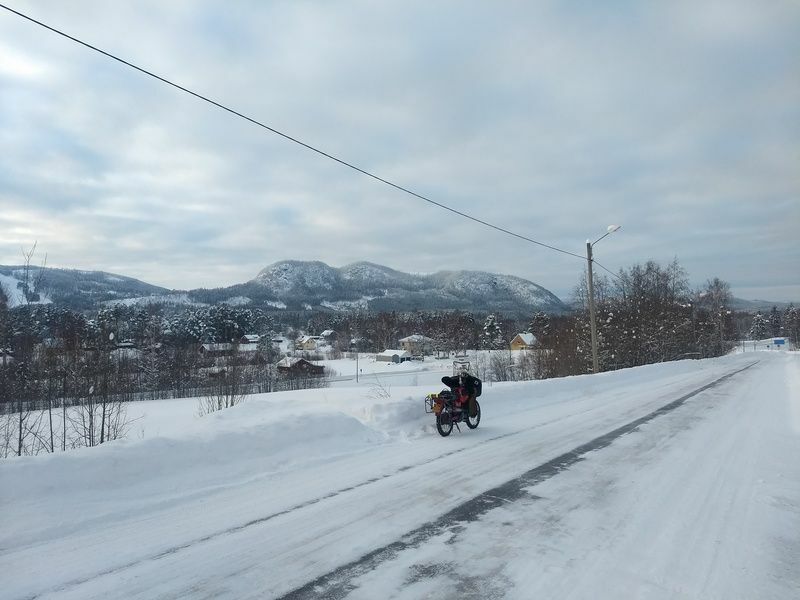 The screws have effect on the white roads, but on asfalt it could be an other story. And on those roads they would fade away easily. 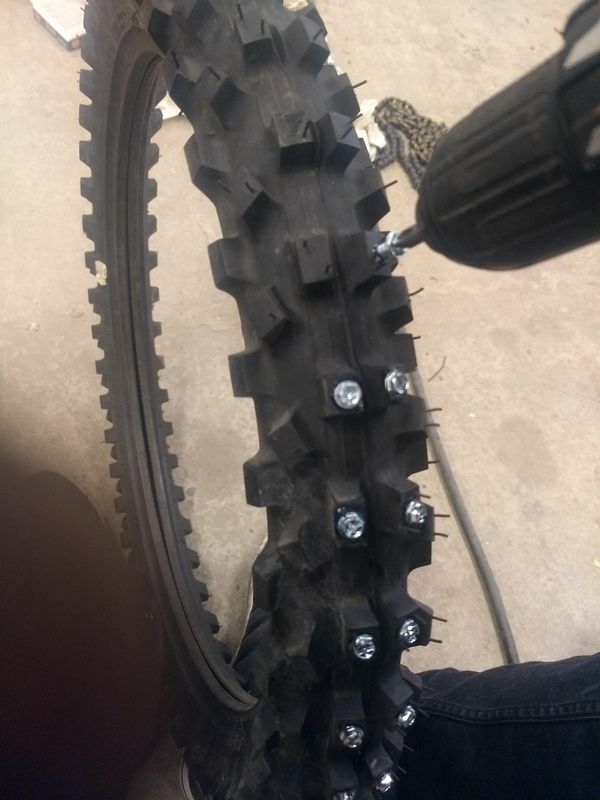 The plan was to test this tire on sunday. 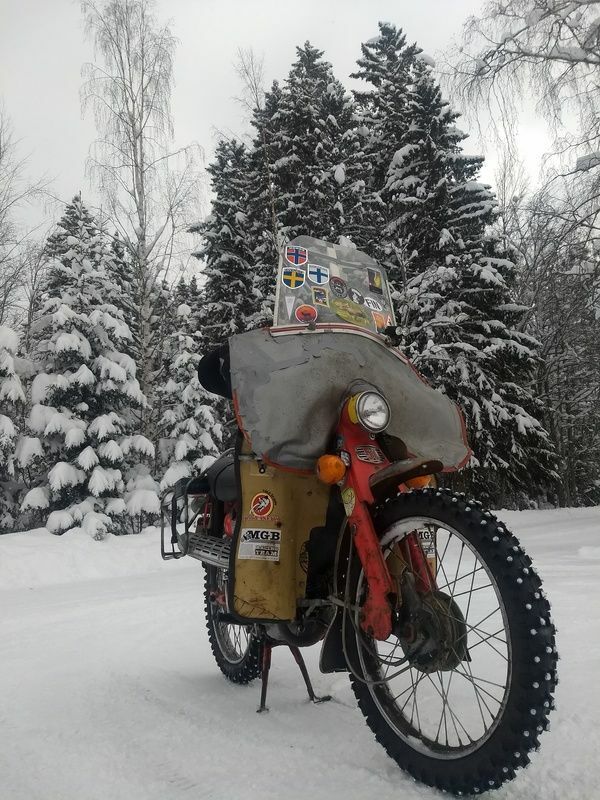 Then I planned to go to the "cold balls" vw ice racing event. On Sunday I got up early to ride the 65km to the event. Then I checked the information on their website and saw the racing was only on friday and saturday. Always check before you... 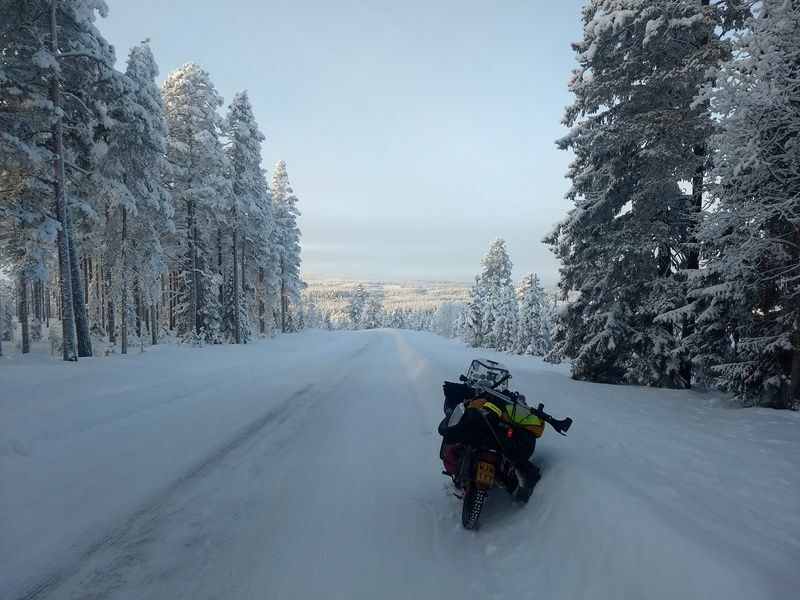 I didn't get up this early to do nothing so I did a bit of joyriding, looking for smaller roads and especially a short left corner. I wanted to practice drifting throughout the corner. I didn't fell but I'll need to do this more. 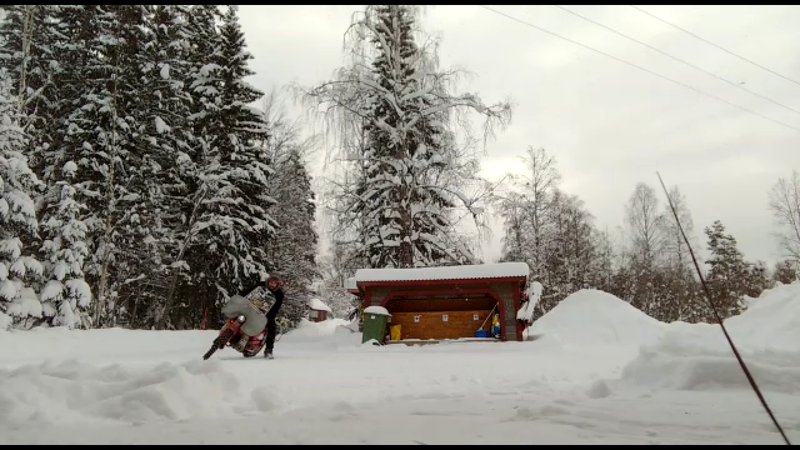 When I came back to Sörens place I could test his Kawasaki 650 with skis. Nothing brought me a bigger smile today than this testride. I took it for a spin and had a great time. Right corners weren't easy due to the foot but the left ones were Gaaasss. I could take it for a longer ride but maybe then I wouldn't want to trade it for the Honda anymore. 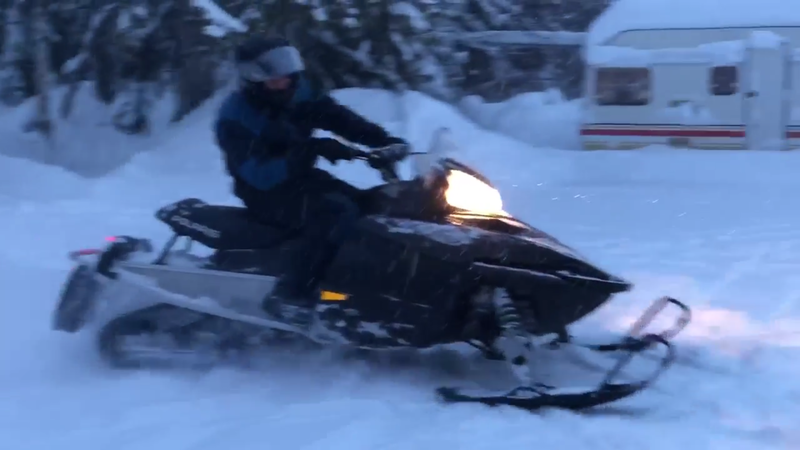 After testing the skis I also could try his 160hp snowscooter. That way to much horsepower, I can tell you that! But apperently 160hp scooters aren't the strongest ones around. 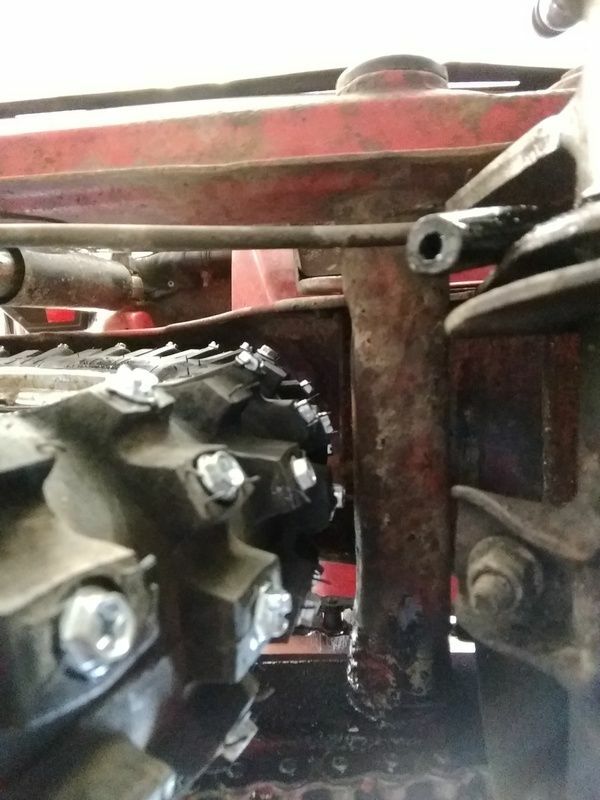 After a positive feedback on the fronttire I decided to do the rear the same way so I put in another 150+ screws in the other crosstire and mounted it on monday. Around mid day I took it for a test and it was not bad at all. The tires will be perfect for the smaller roads I was planning to do. I took it to the supermarket and just when I planned to go inside an other guy, Allan, came outside the shop. He saw the windshield covered with stickers and asked me where I came from. Seemed he rode harleys and he invited me to follow him to his house just outside town to drink a cup of coffee. Why not!We had a nice chat and he showed me some of his cars and motorcycles. Nice place to see, once again. It's always nice to meet people with same interests. More known as the sleeping Elephant. See it? It's great! Old church on top of the mountain. Back in 1700 the water used to be on this level. boboneleg, Uke, Knobbly Studios and 27 others like this. 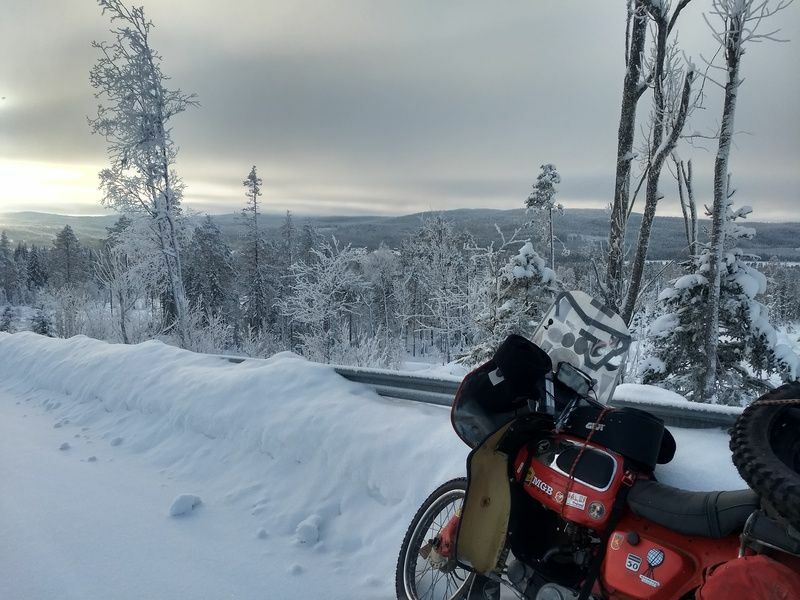 I am in awe of your winter motorcycle adventure. Beyond Amazing. Enjoyed it very much. 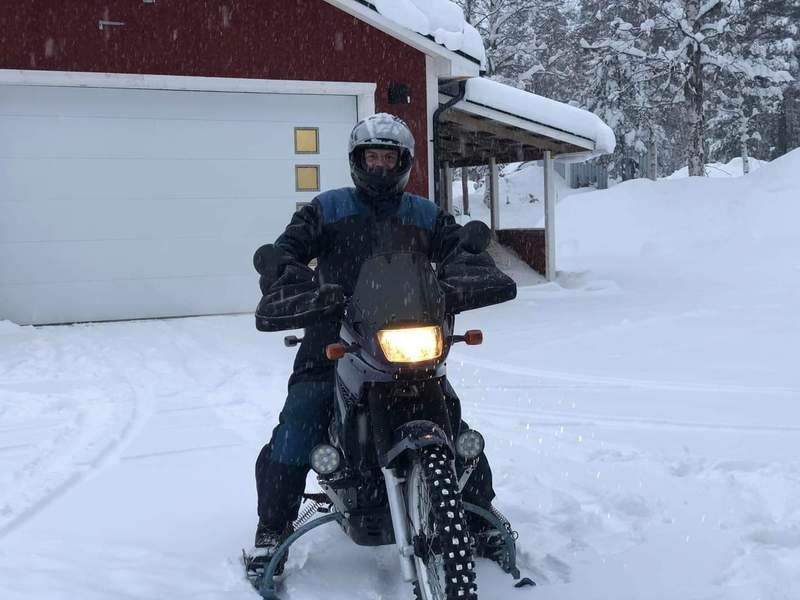 Living in Texas riding in such extreme cold and snowy conditions is beyond my imagination. 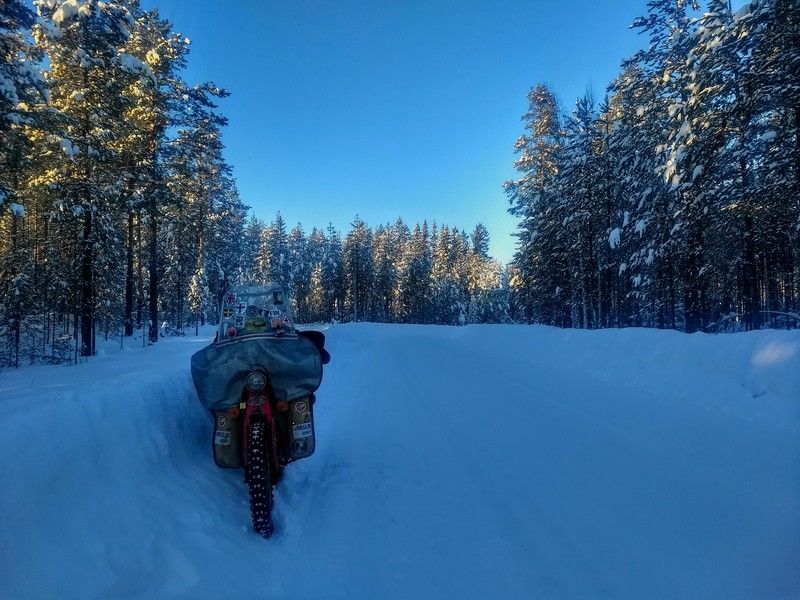 Thanks for sharing your EPIC RIDE Report. Mediocre Man, sarcus and CROSSBOLT like this. After a big breakfast I said goodbye to Sören and headed direction Alby. Sören knows a guy called Gert who lives there and arranged a bed. He told me the conversations would be fun. 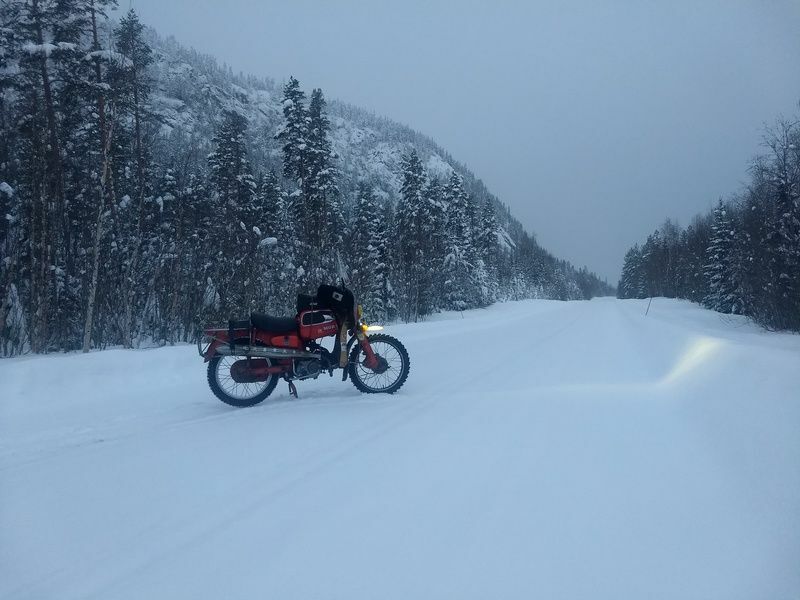 The road I took to Bräcke was bigger than I thought it would be. 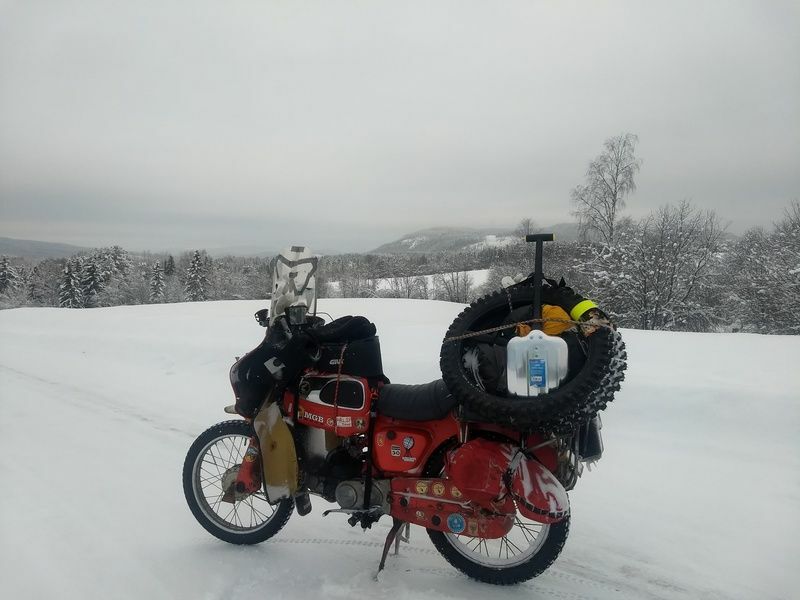 Conditions of the ice were very bad and the tires seemed not to be the best options. I think until today the roads had been nice and today was all about keeping the bike on two wheels. After a hamburger with fries in Bräcke I took a smaller road next to a railroad that would end somewhere between Ange and Alby. 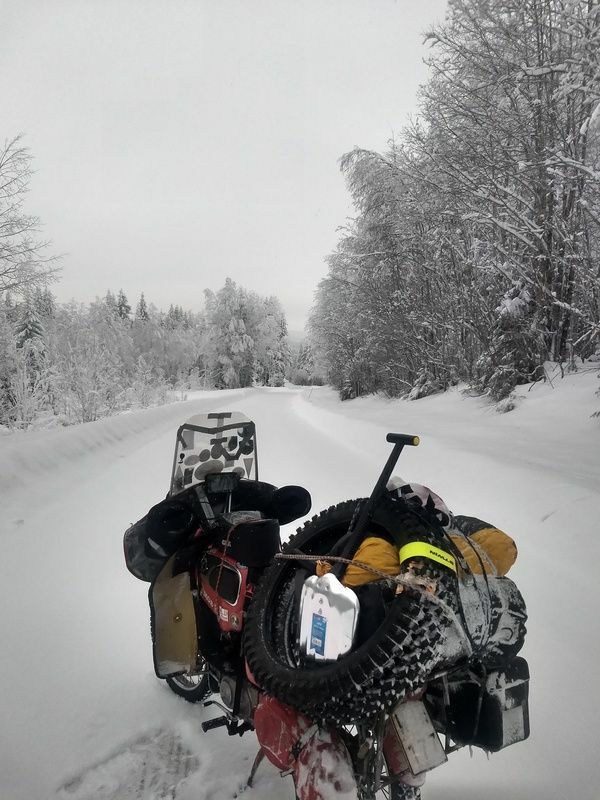 After 70km of bad conditions this was a more relaxing road and the tires worked very well. It suited perfectly to the beautiful day and I could take a couple more pictures of my bike but with diffrent backgrounds. With the speed of a turtle I arrived at Gert's place after half an hour. He saw the cold in my eyes and offred me a cup of heated Jägermeister. 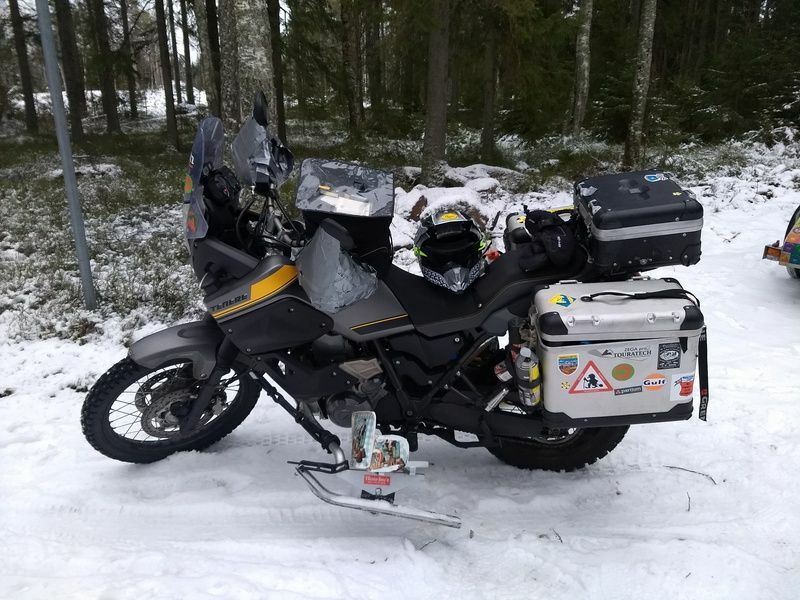 Gert rides a gs1200 and leads guided tours through Europe. It sounded like he had his life together well. And it turned out to be a funny guy also. 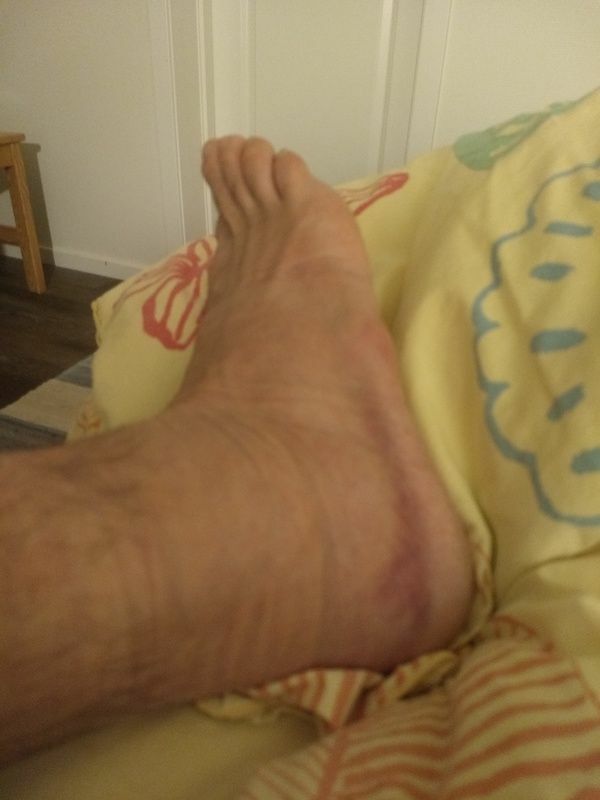 After a healthy Moose-vegetables dinner and a dozen of stories I went to bed early, mainly because my foot was thicker than my grandmother's. For a second time. On wednesday after a bad night of sleep I went outside and saw -23 degrees on the thermometer. Looks like I'll have to pump up the Coleman stove again. The day before Gert had given me a couple of .gpx files that I could use more south. He also gave me the directions to ride today. 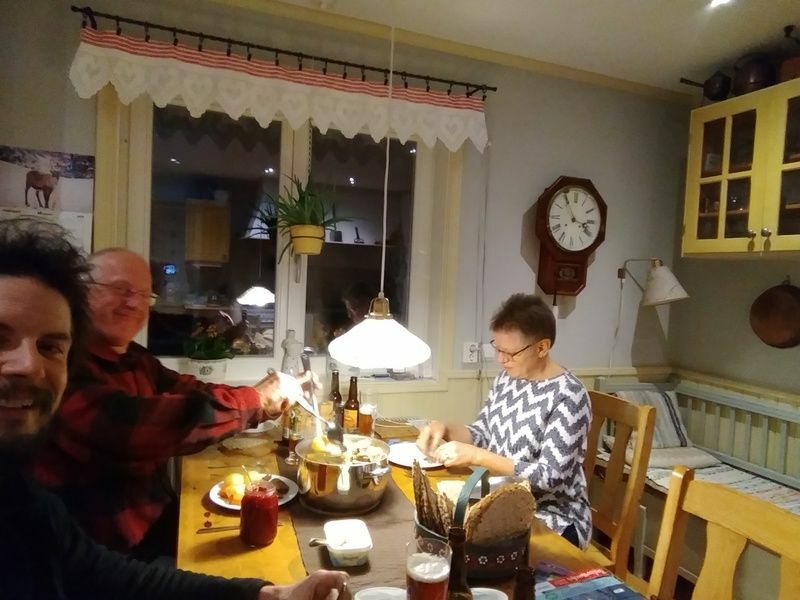 I had to go direction Gävle and booked a B&B in Los. The gravelroad shortcut started right in front of Gert's house. After 30minutes the Road I needed wasn't plowed so I checked the map and continued. After another 30 minutes the road I needed wasn't plowed and if I went further this road it would end. That meant getting back to the starting point and use the big roads until I got back on track. 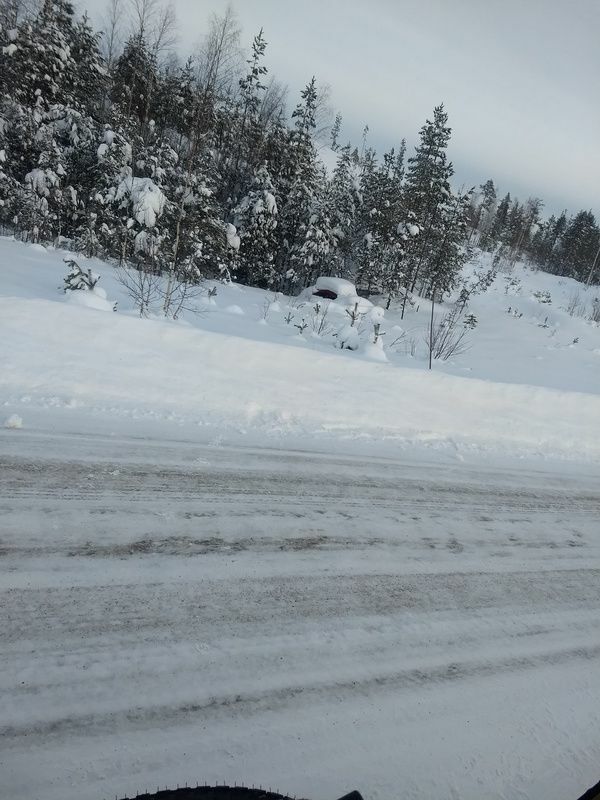 The Road from Ostävall to Ytterhogdal was horrible again but I managed to save every possible crash. 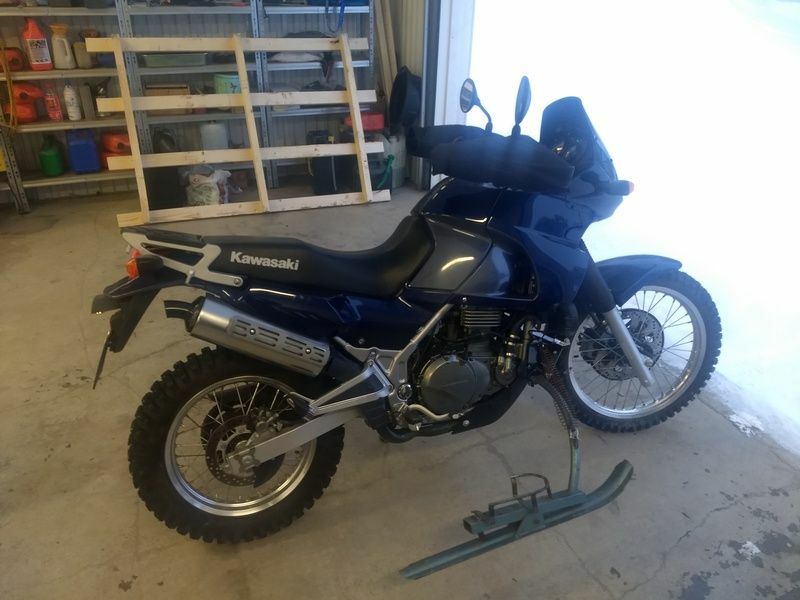 I better had stolen the ski's from the Kawasaki. 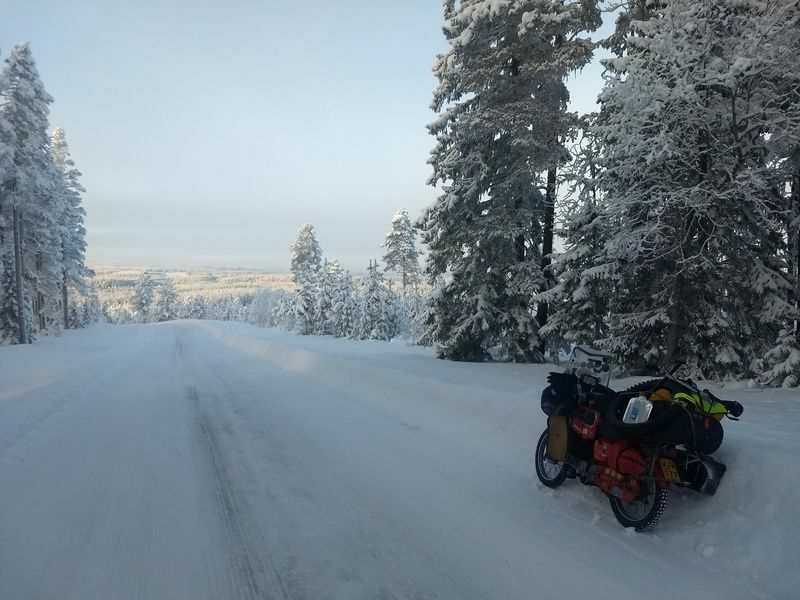 Just before Ytterhogdal I took a gravelroadshortcut that Gert had recommended. It turned out to be a magnificent road and cut of 20km! Riding here already made me forget the struggle before. 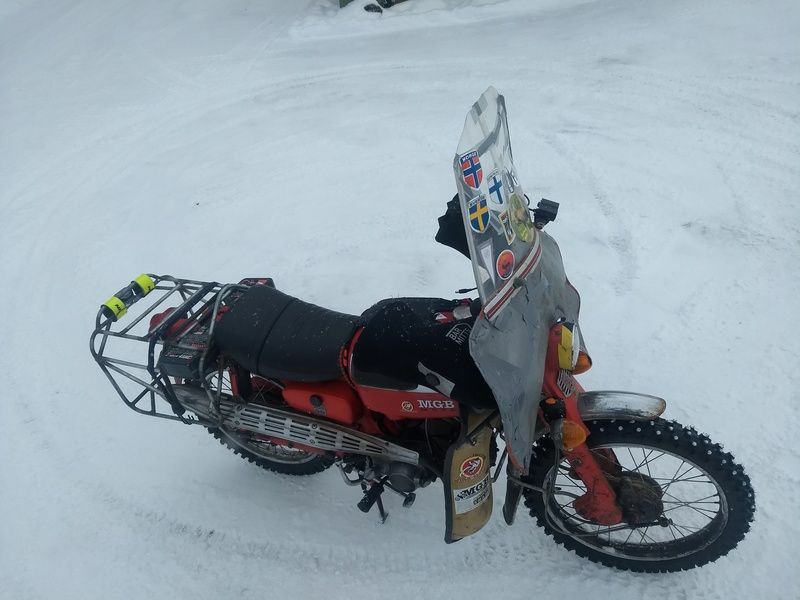 Even the speed went up and then I got into a deep well below the snow and before I knew I was sliding for 10 meter on the left side of the bike while still sitting on it and keeping the engine on. 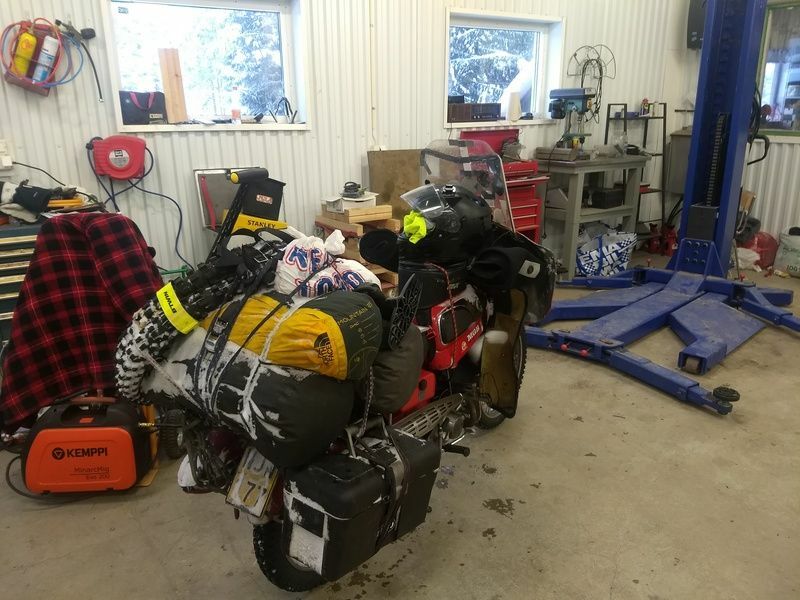 Without enjuries I got the bike up, bended some stuff back and drove away with a smile. I didn't care about this one because I managed to save my right foot. Just before I arrived in Los I spotted this old car. If someone knows what it is please tell me. I've searched but I have no clue. When I got my stuff inside the b&b I booked a second night. I decided to stay in bed for one day with my foot up. 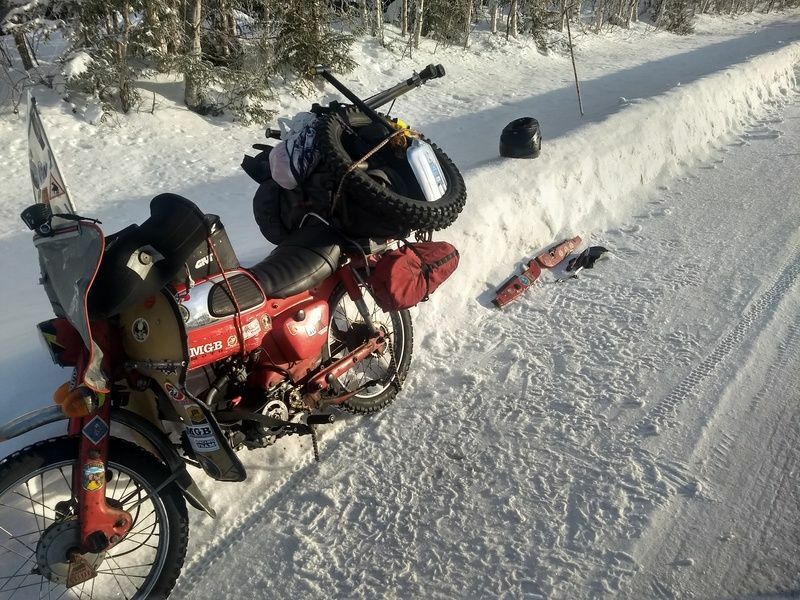 I prefere to get the Honda to the finish rather than finish with an abruptly end. Also the question how to finish has risen up again. 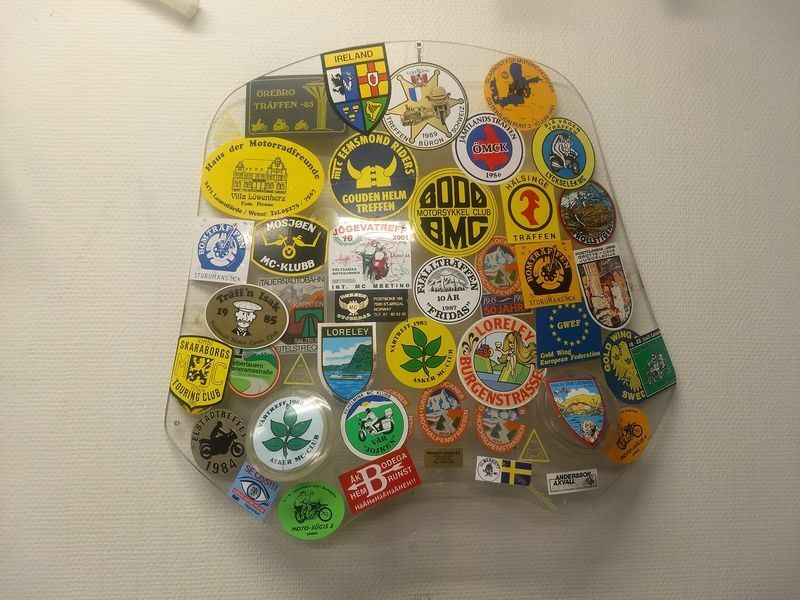 After the slasktraffen in Vetlanda I keep doubting the option Göteborg-gent vs Göteborg-Frederikshavn and riding it to Belgium. The only contra is the difference in traffic I'll come across and will it add value? Maybe I'll try to do some Dutch and Belgian TET sections in between. Maybe ask for some enduro boots for your birthday? belgium is one mud pool at the moment if you are considering following the Tet home. What an amazing trip! Really enjoying reading about it. btw- Thanks for taking us along , we all know the trouble you go thru to get the story posted up! Thanks for you efforts. One of the best reports.
" Just before I arrived in Los I spotted this old car. If someone knows what it is please tell me. I've searched but I have no clue." 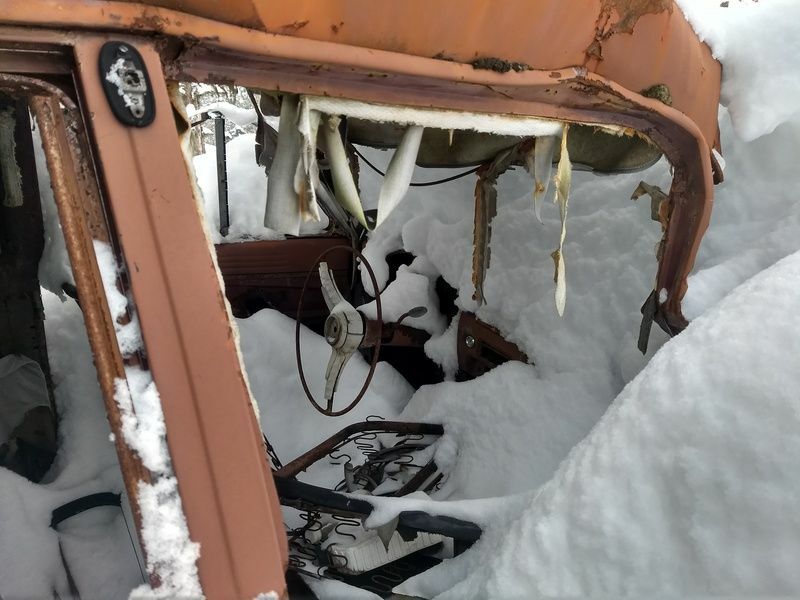 Since you took the day off, if you wouldn't mind, would you please go back to that old car and shovel off the rest of the grill and the back end also for us??! You sure didn't give away many clues! 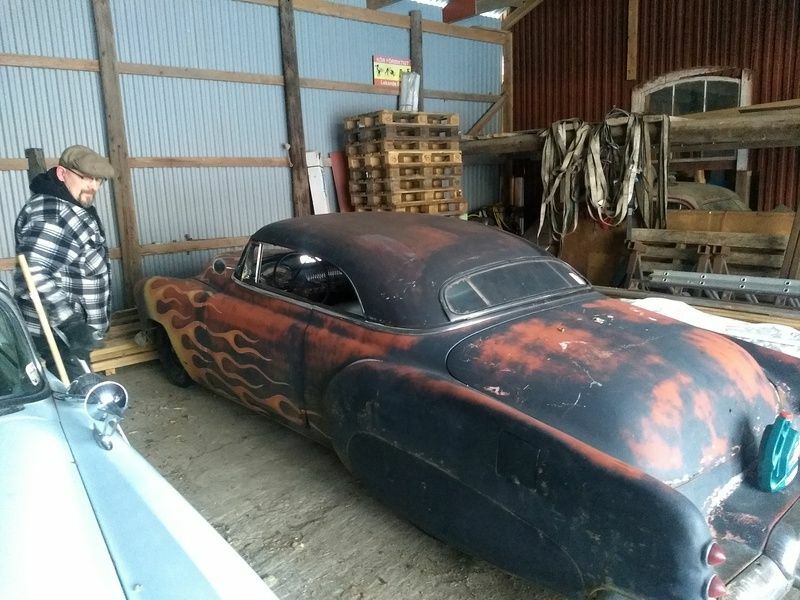 The cut out bump in the front of the hood and the cross bar smacks of an Edsel, but it is not nearly that large a car. I don't know my old European cars, but if i did that hood should be a giveaway. Interesting you haven't had more guesses. Vauxhall? Nope. Good puzzle. This isn't it, but you get the idea of what we're looking for in the grill/hood.